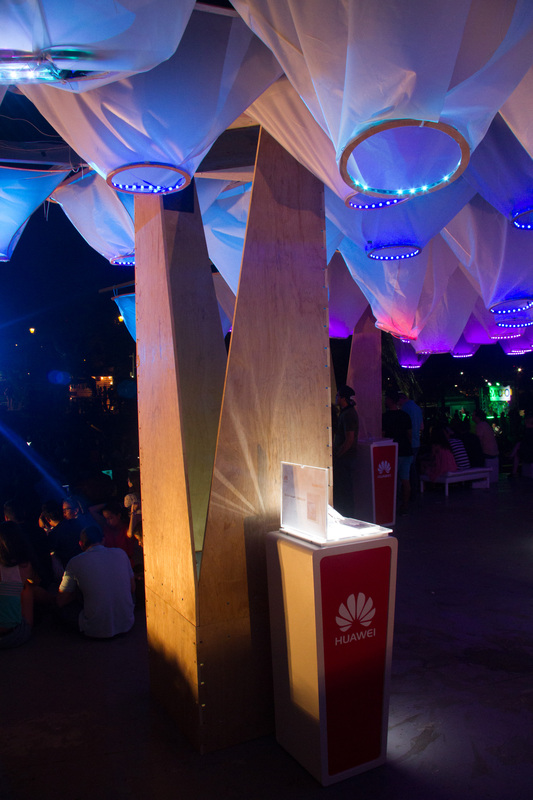 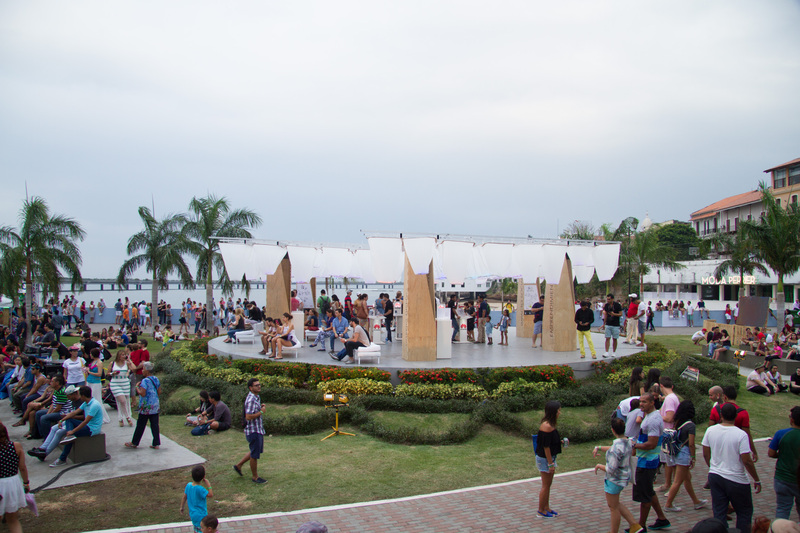 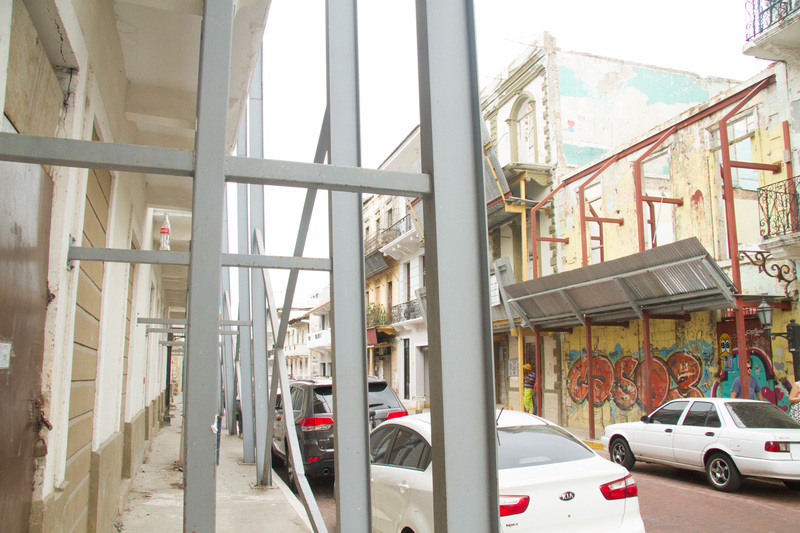 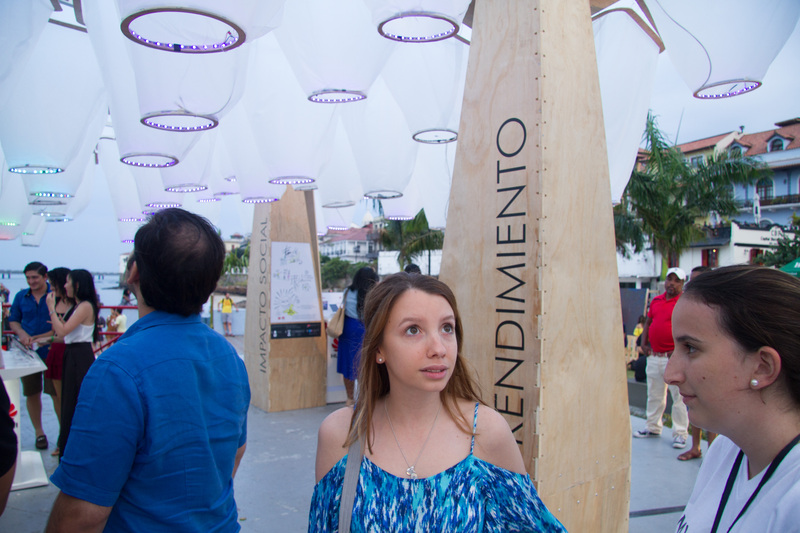 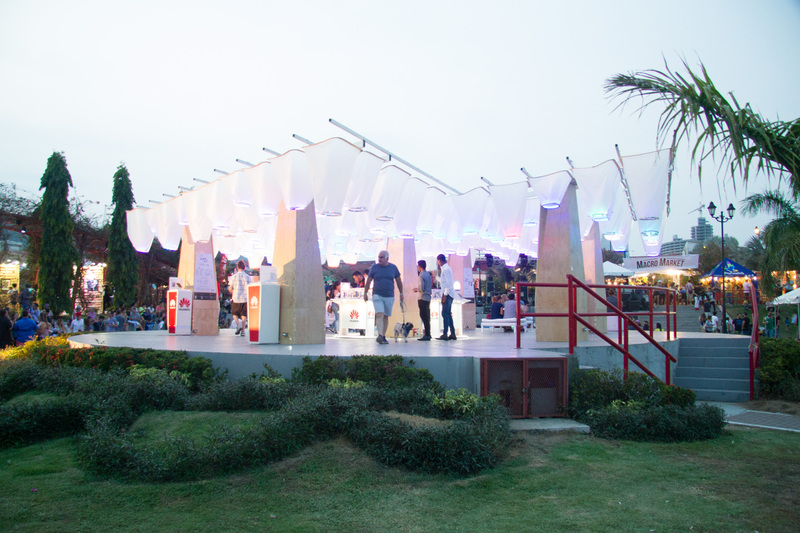 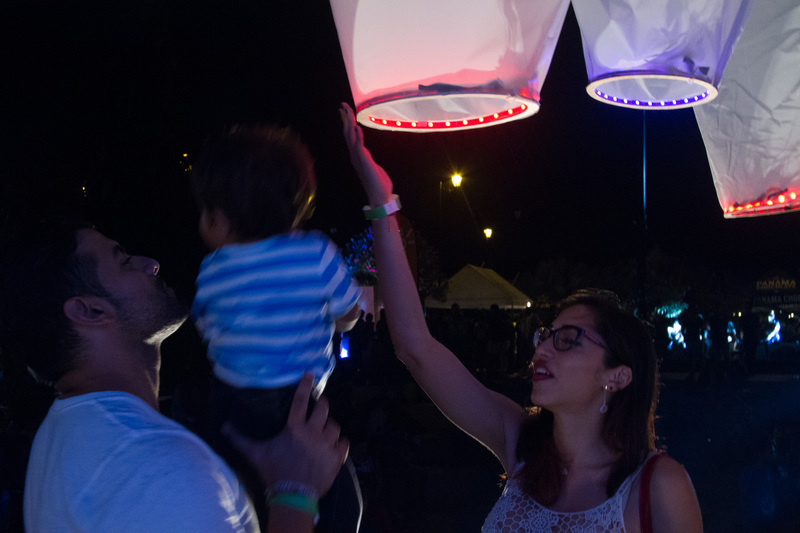 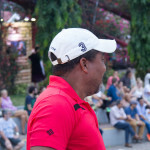 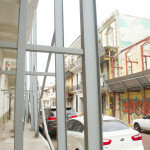 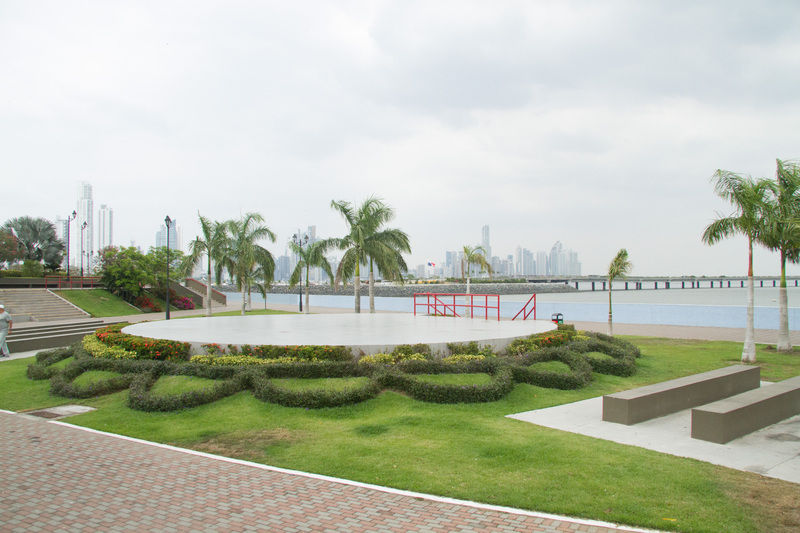 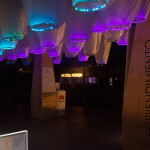 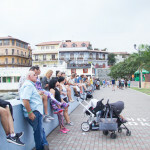 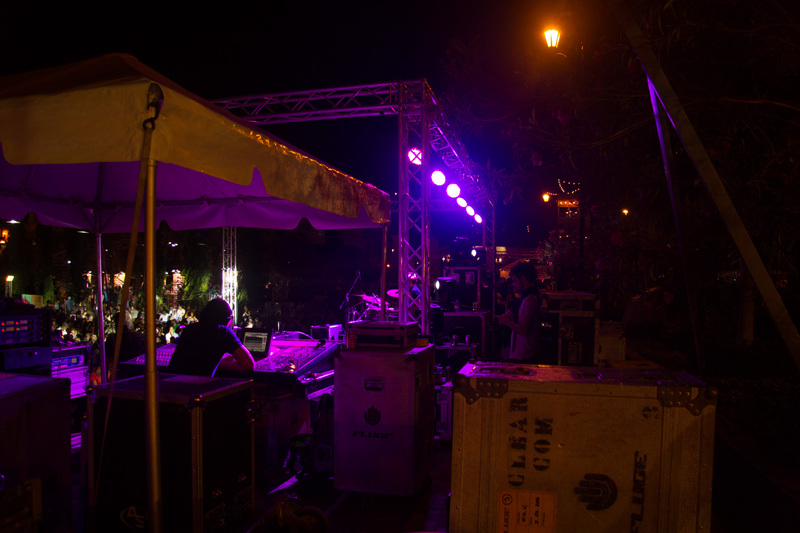 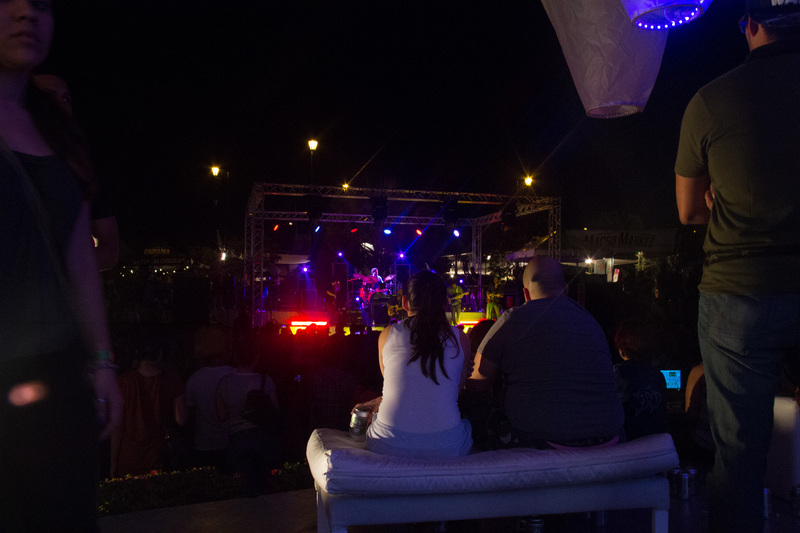 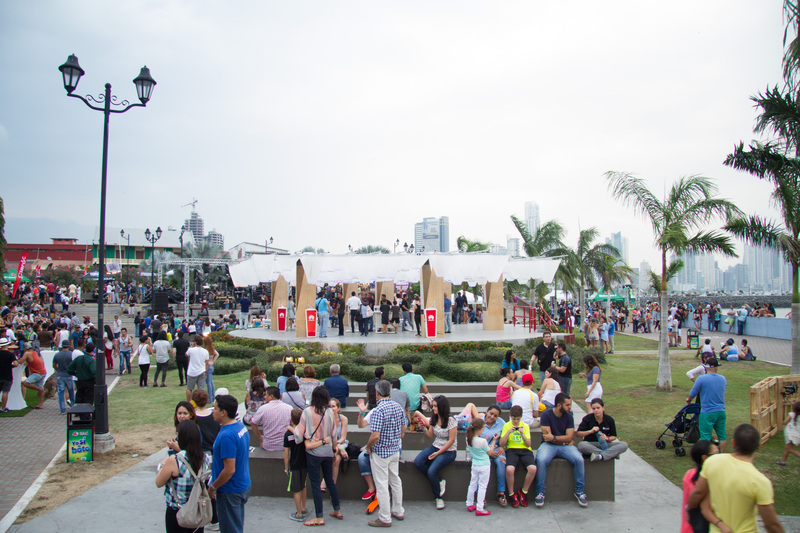 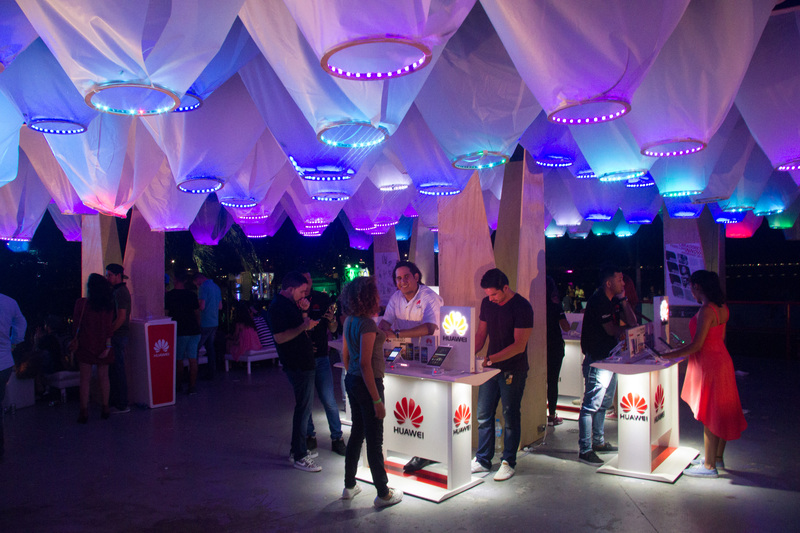 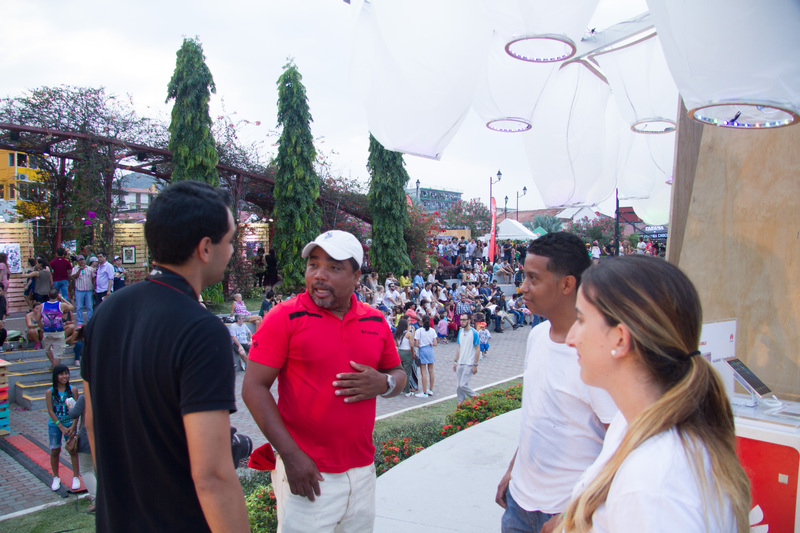 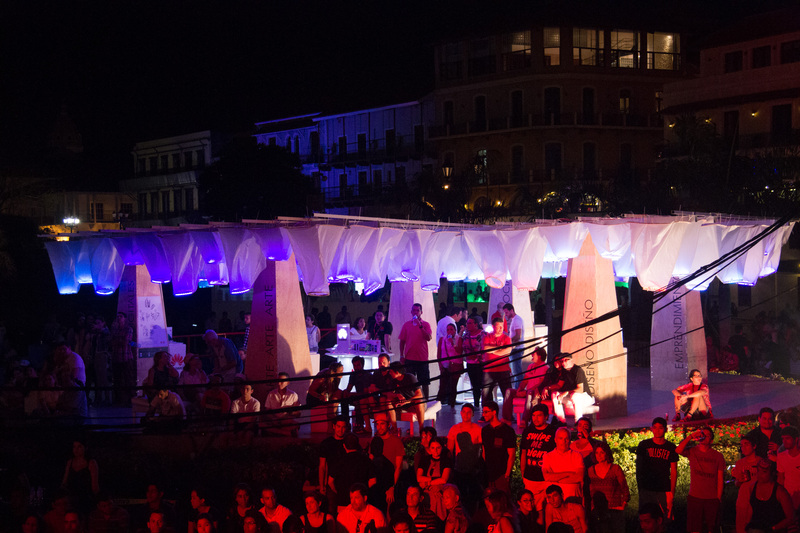 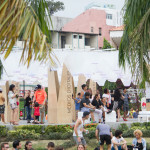 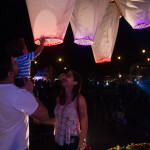 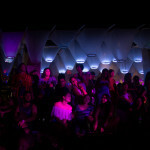 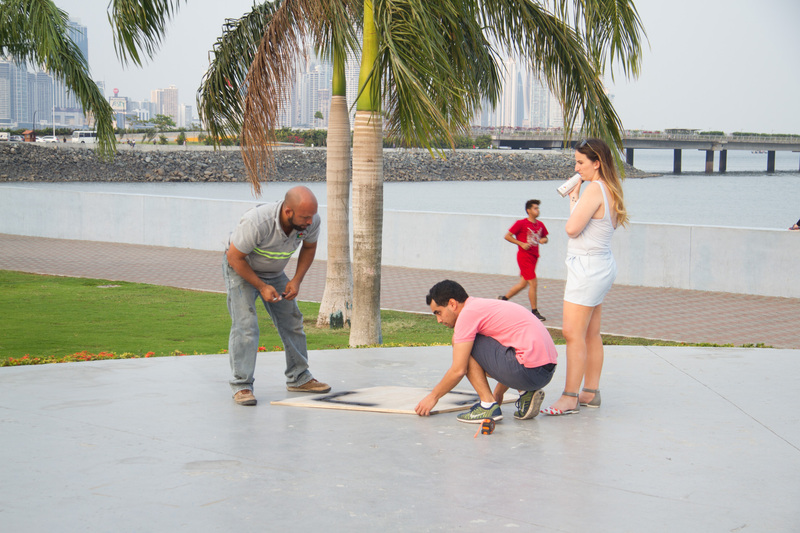 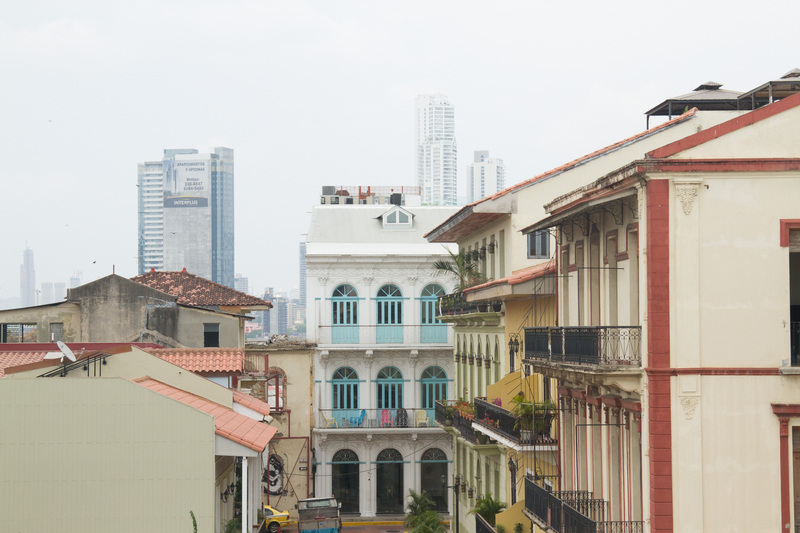 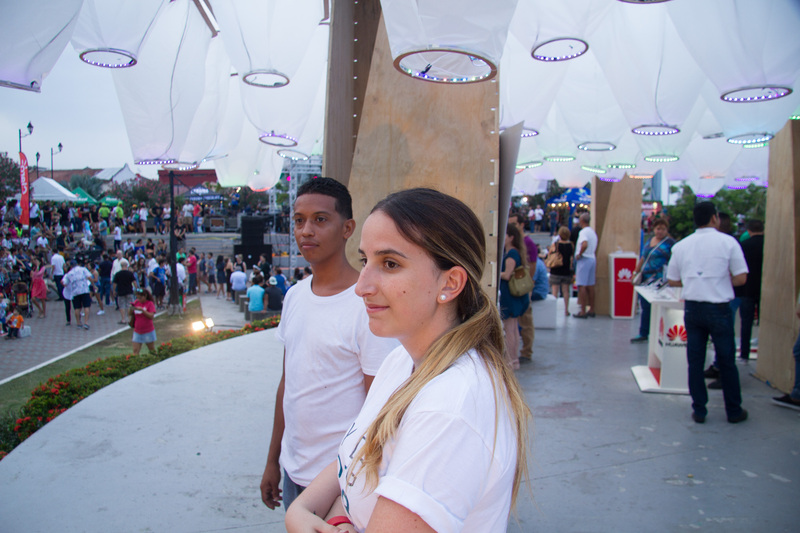 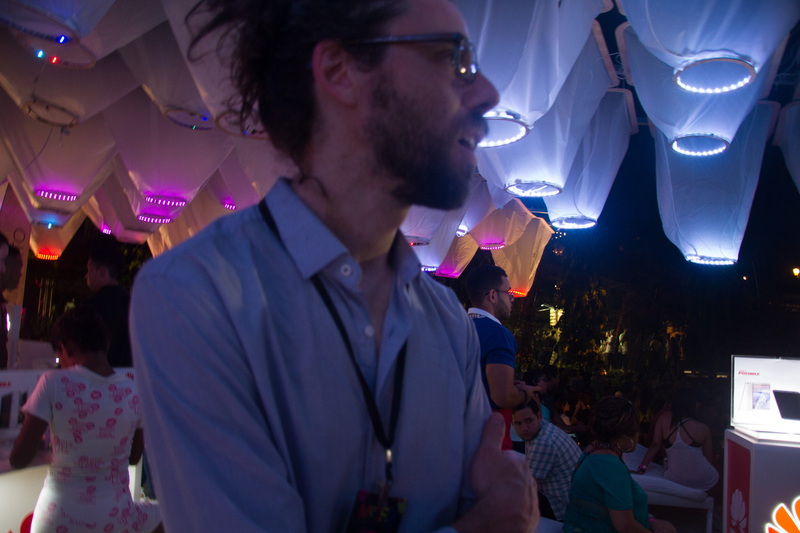 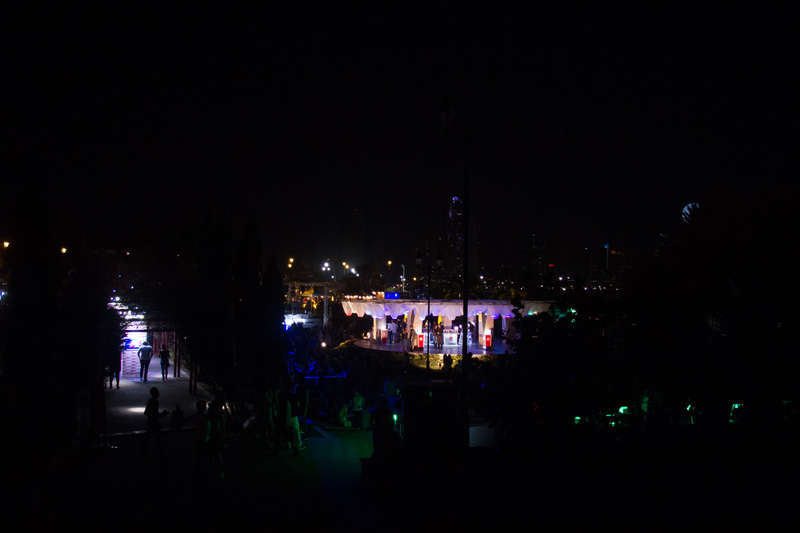 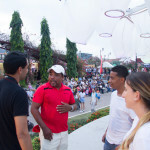 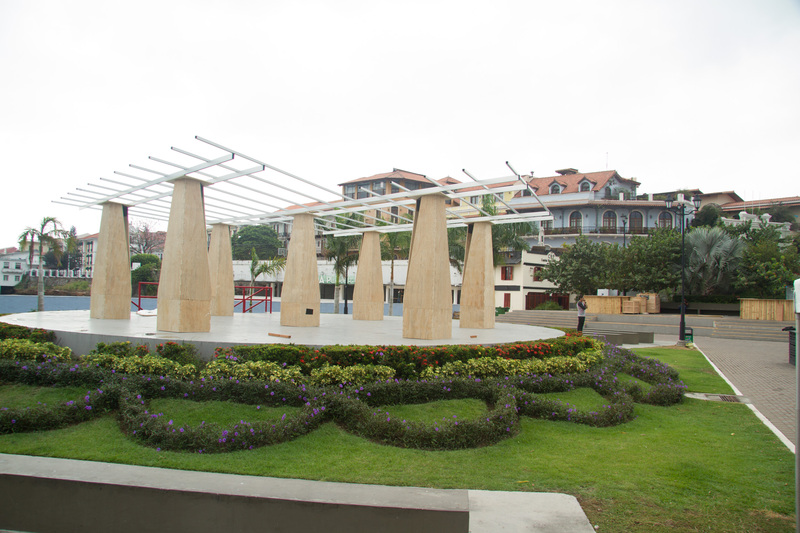 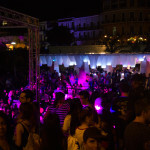 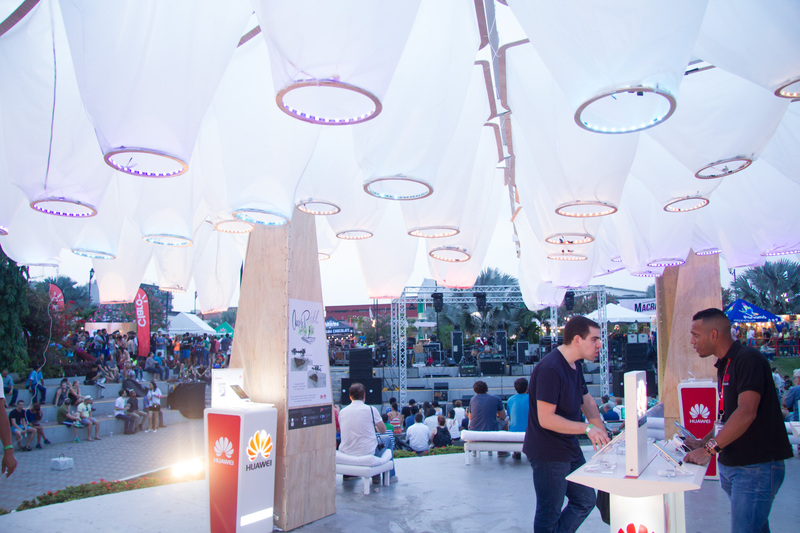 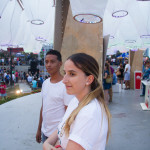 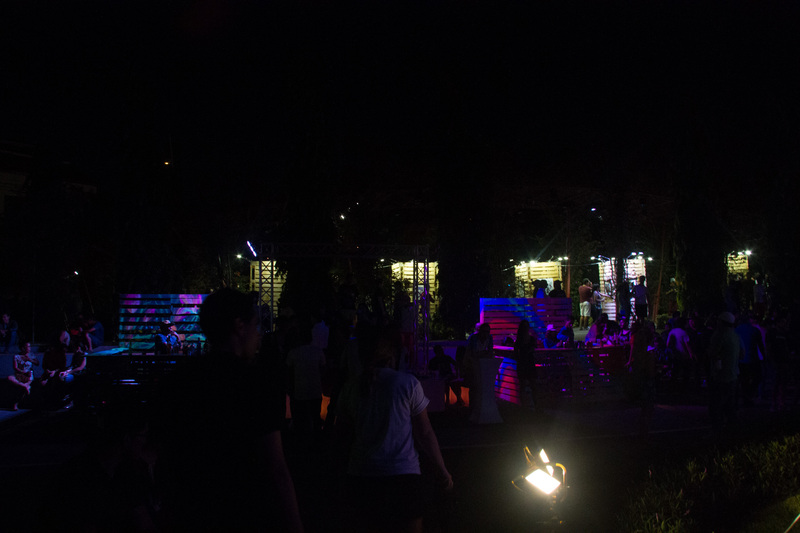 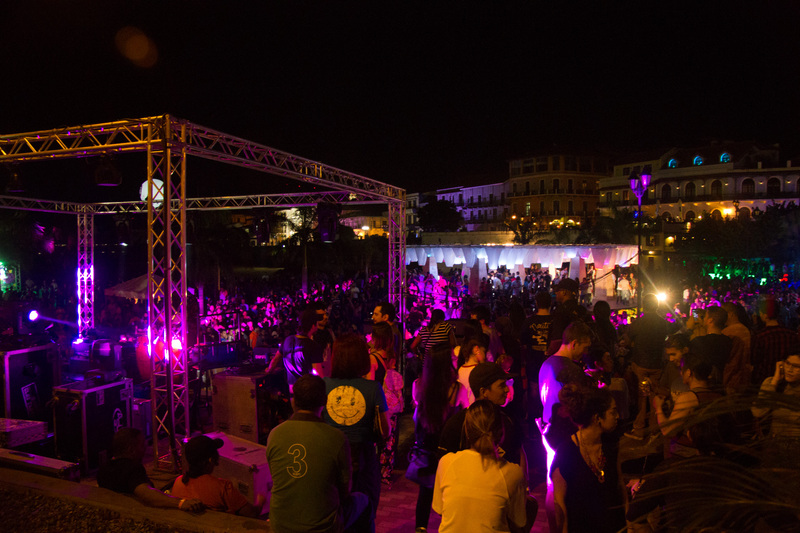 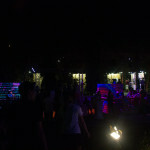 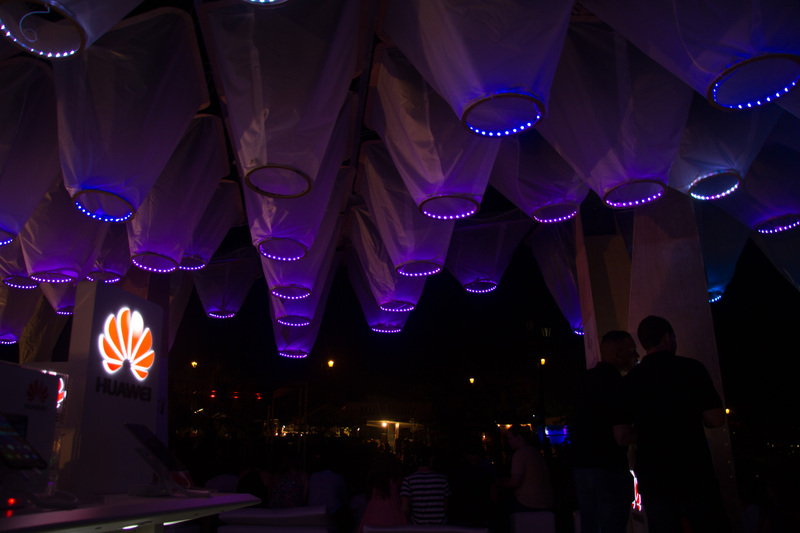 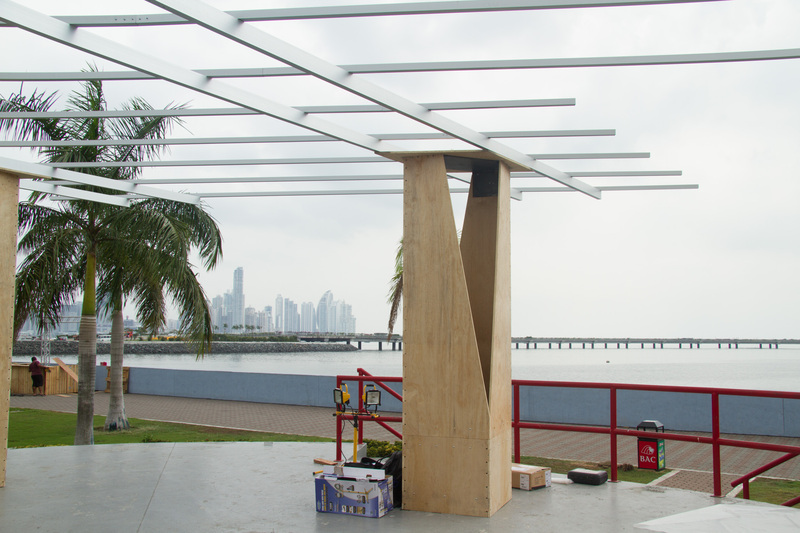 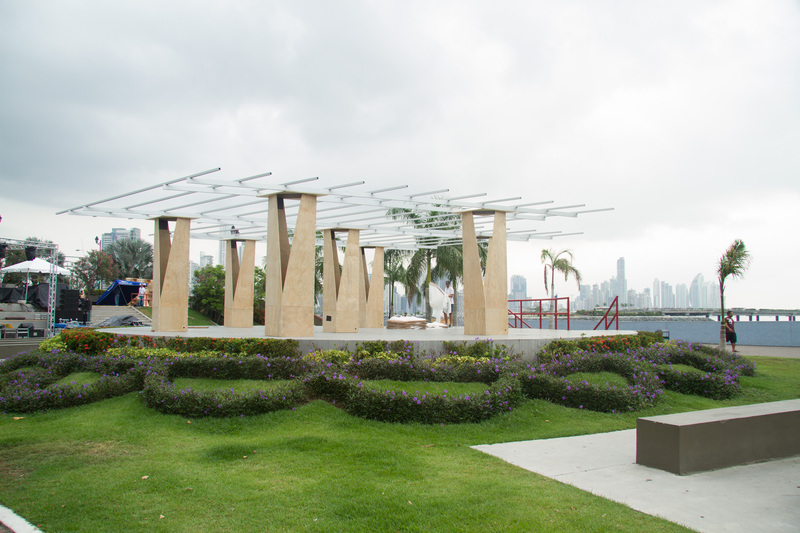 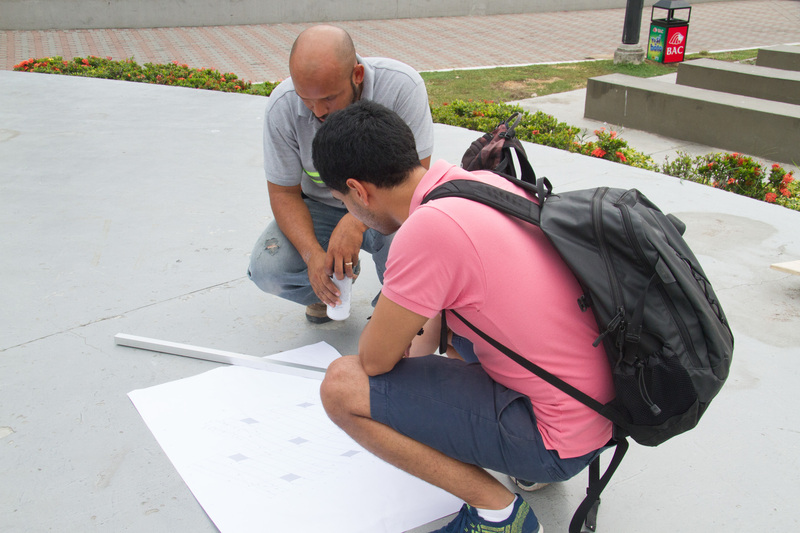 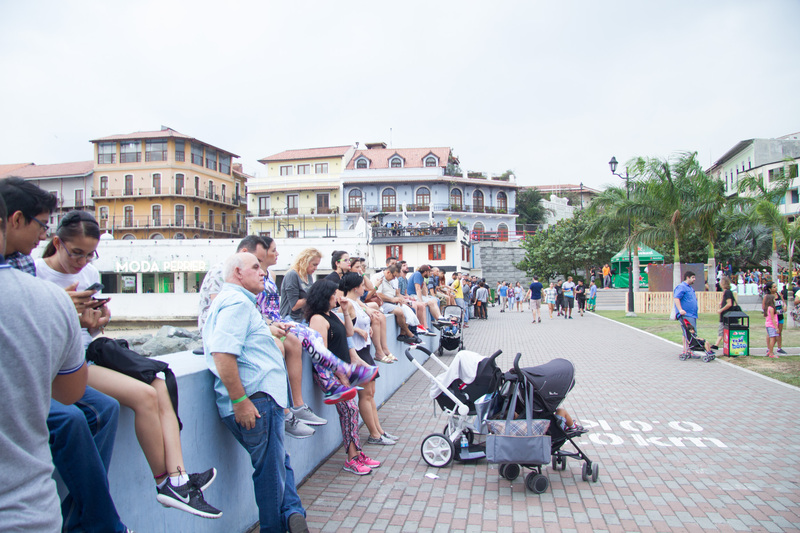 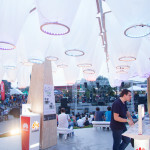 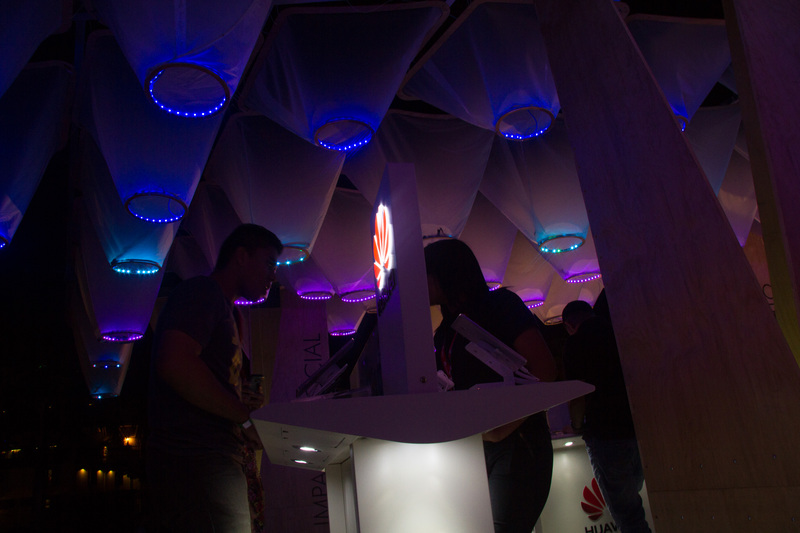 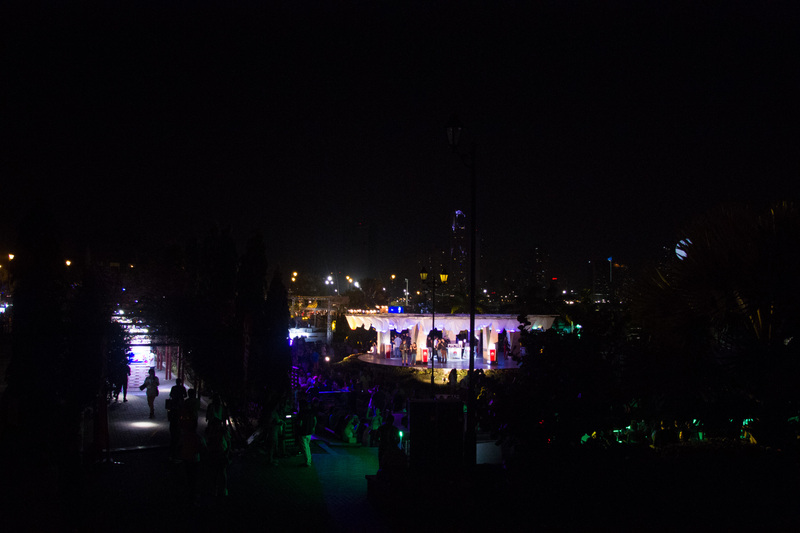 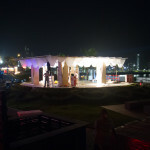 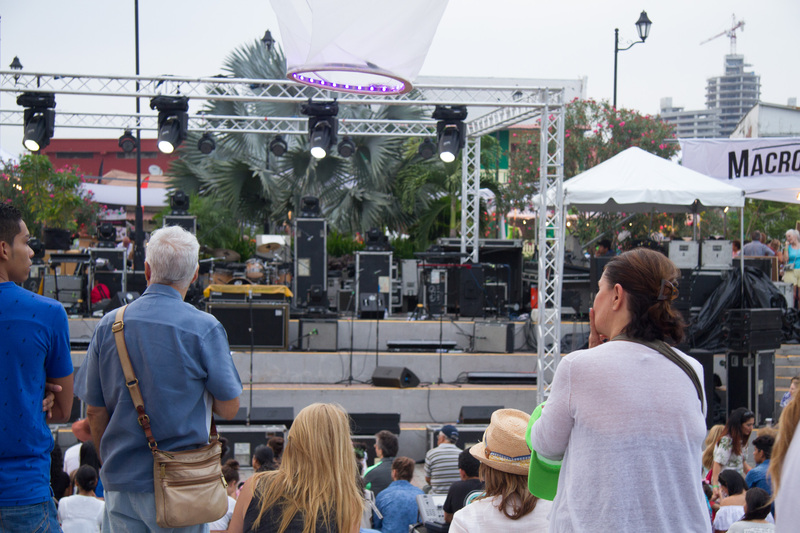 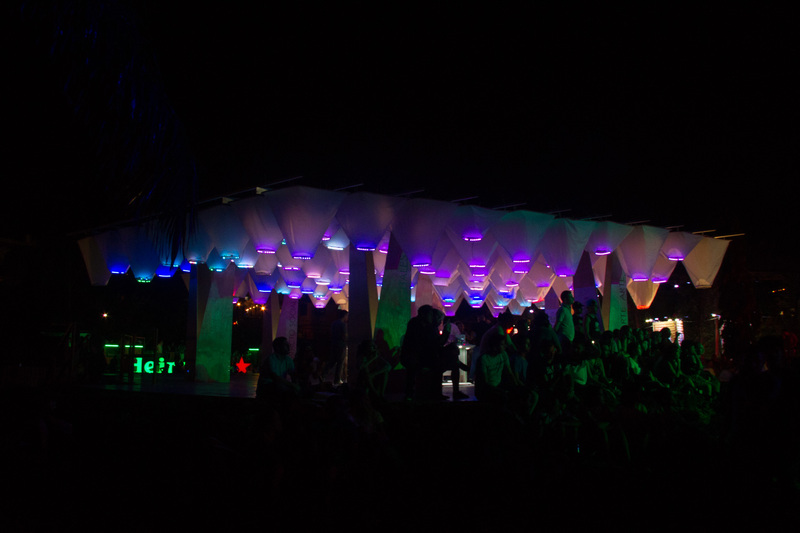 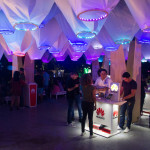 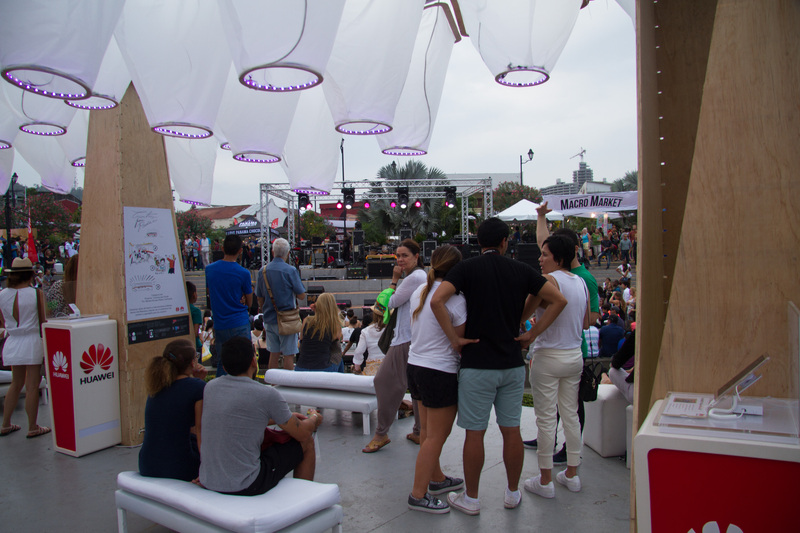 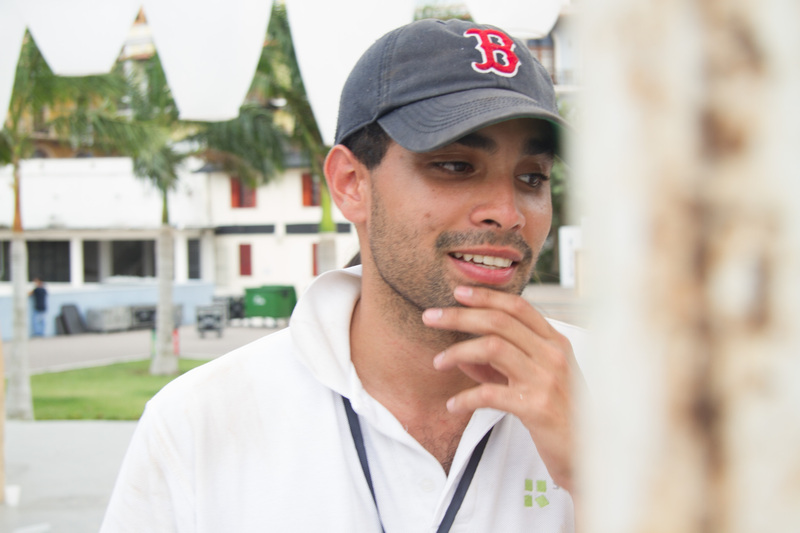 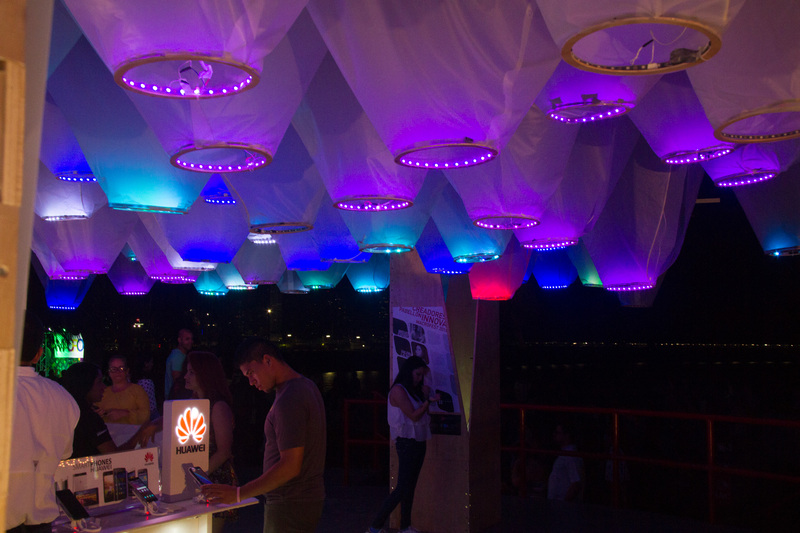 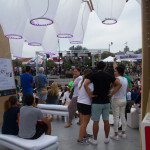 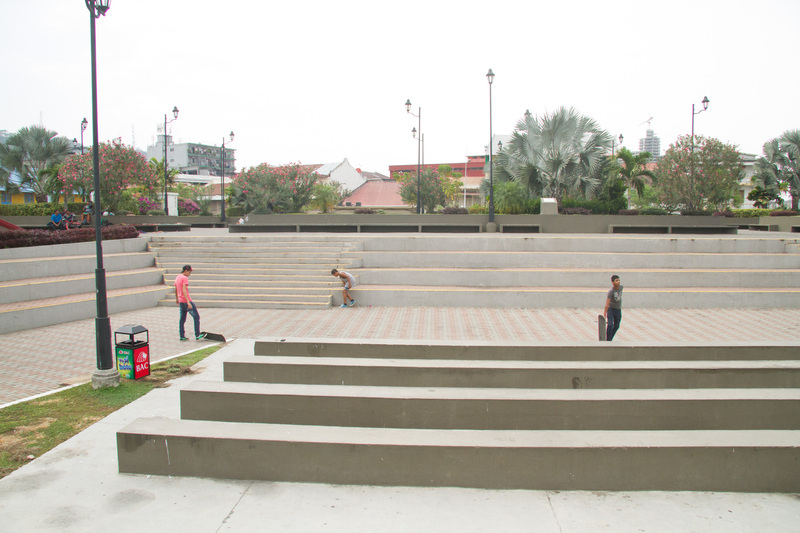 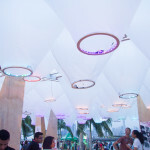 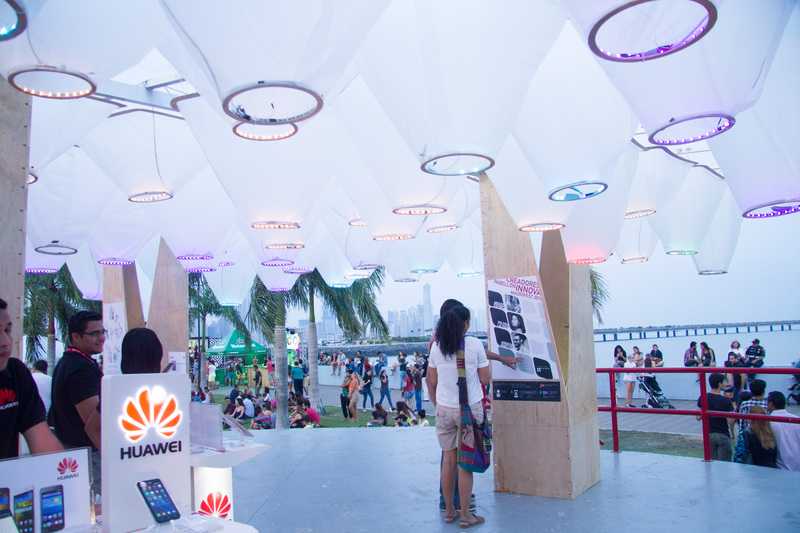 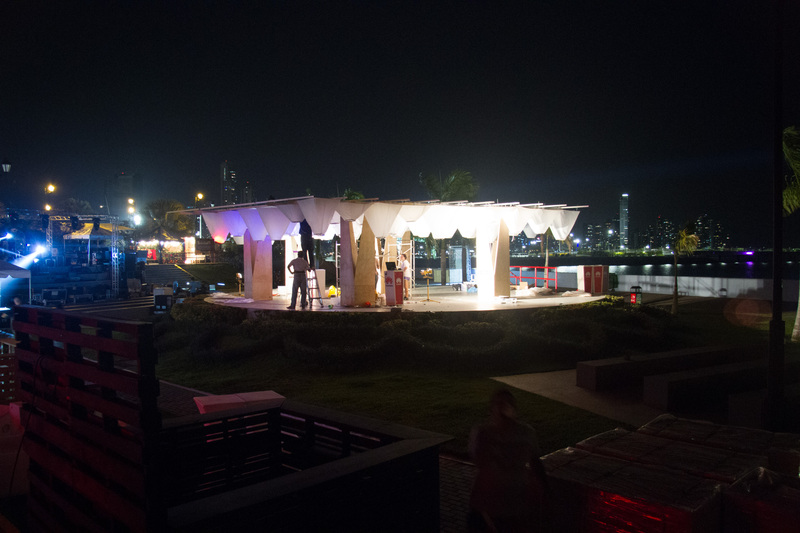 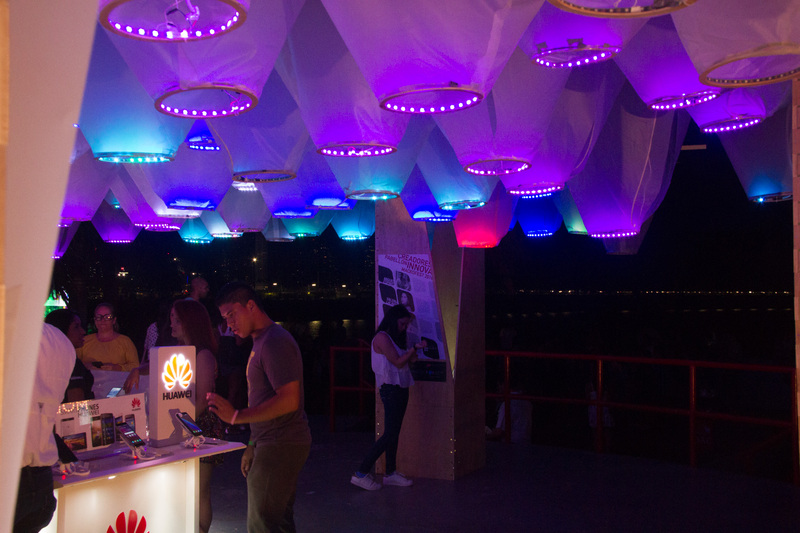 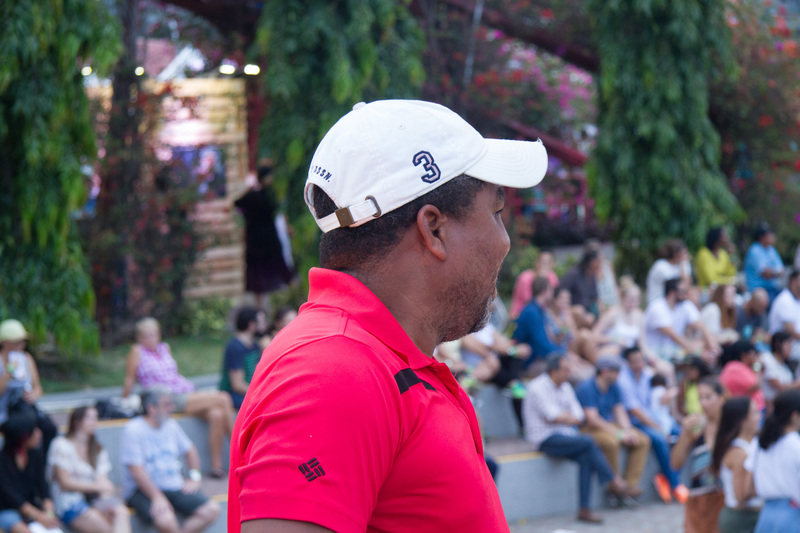 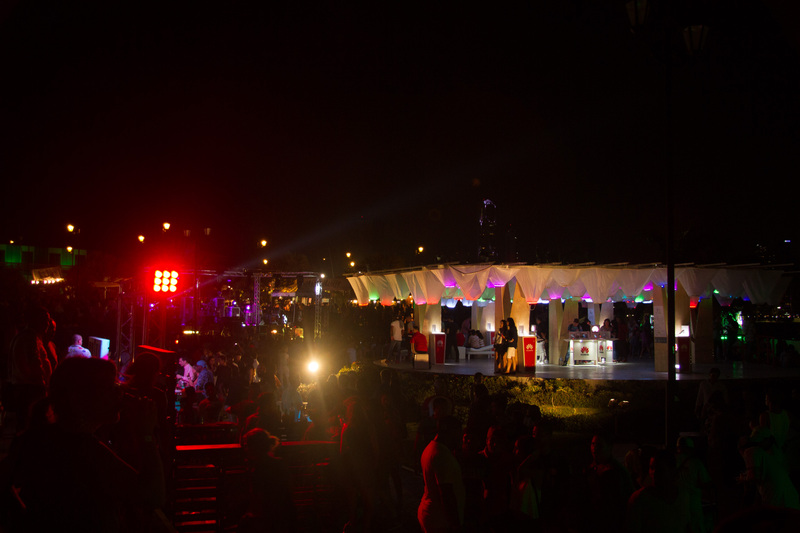 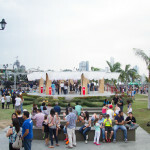 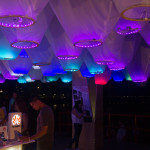 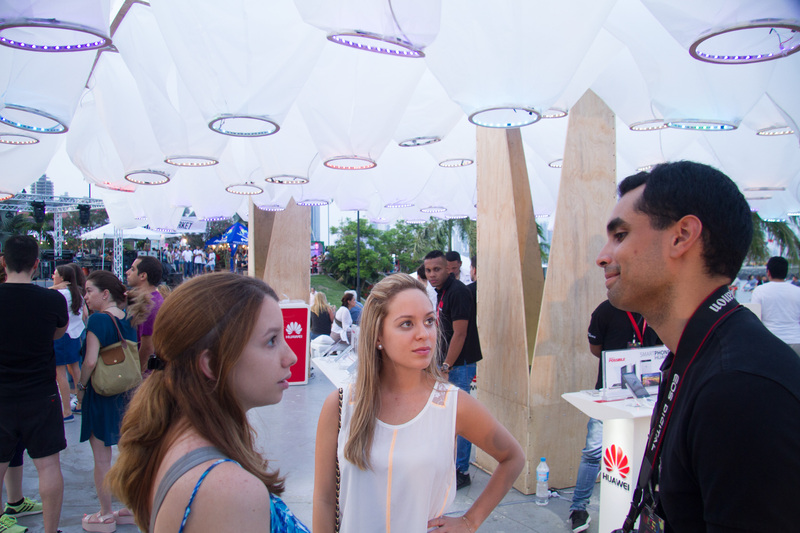 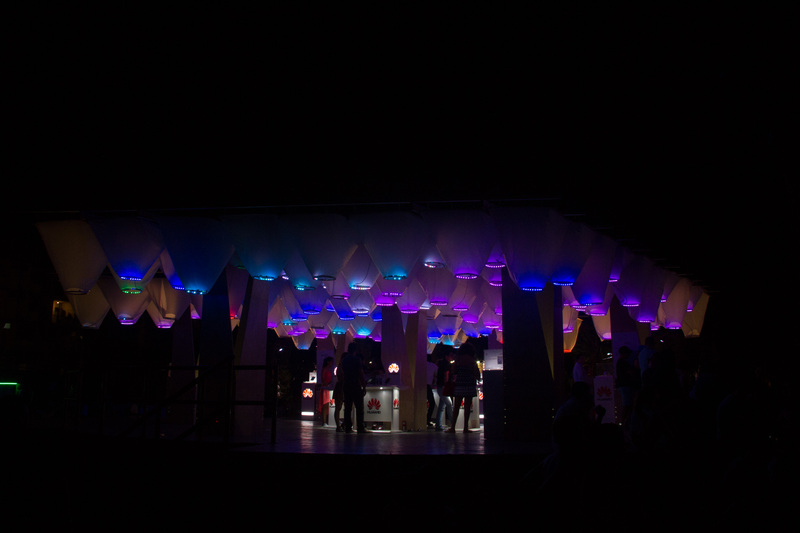 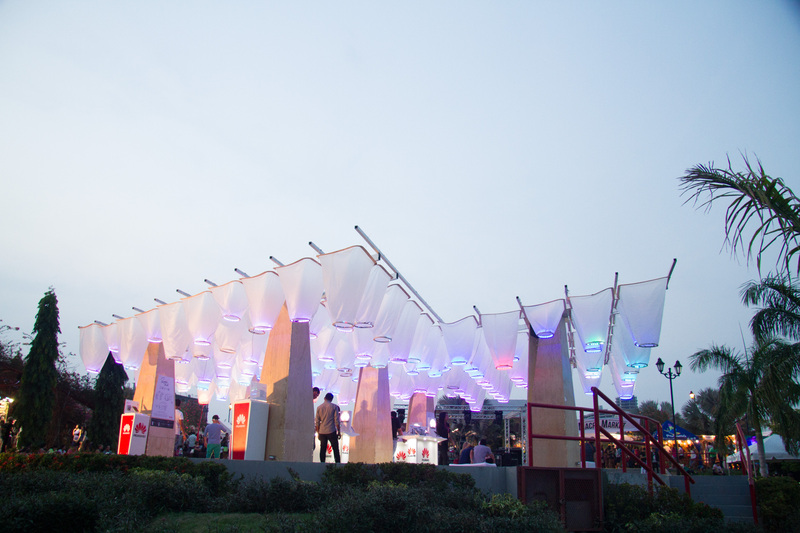 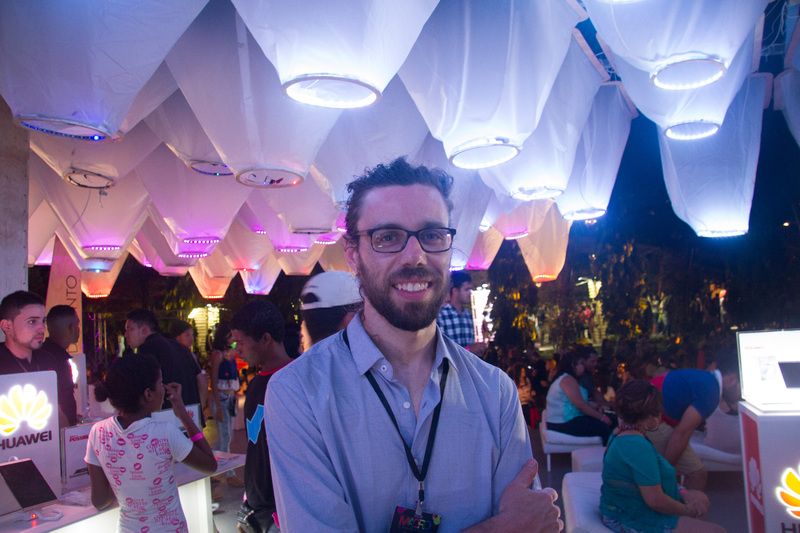 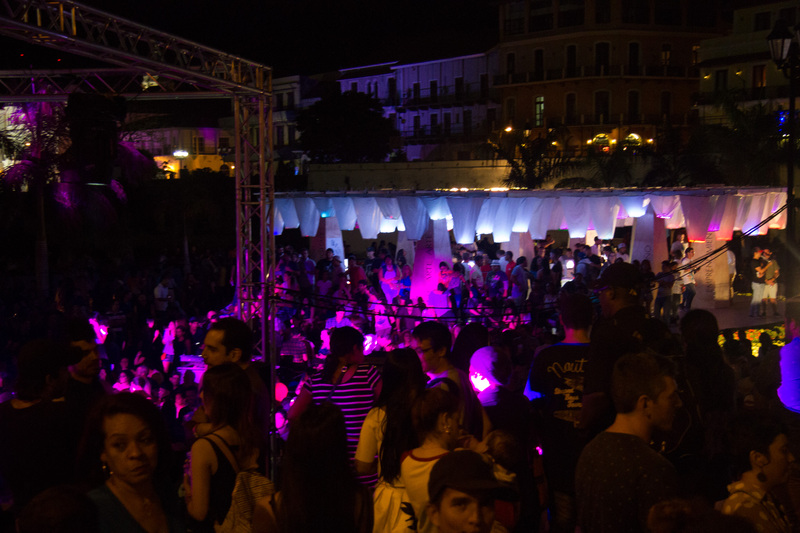 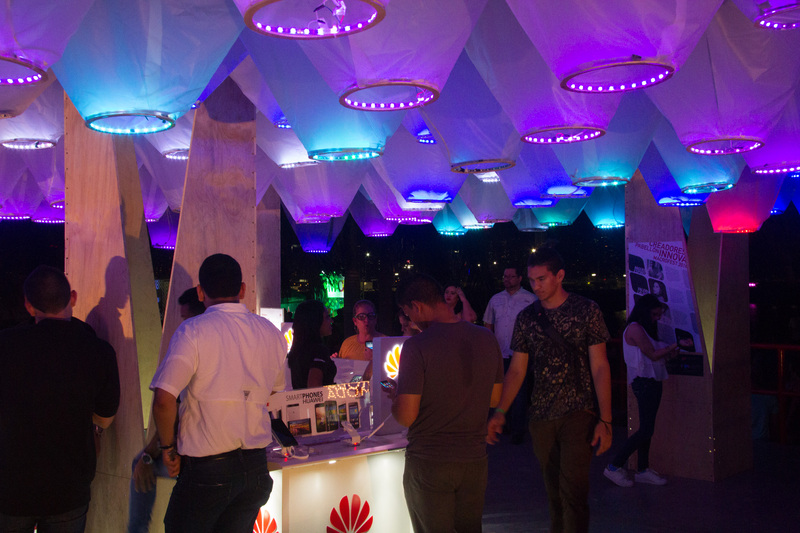 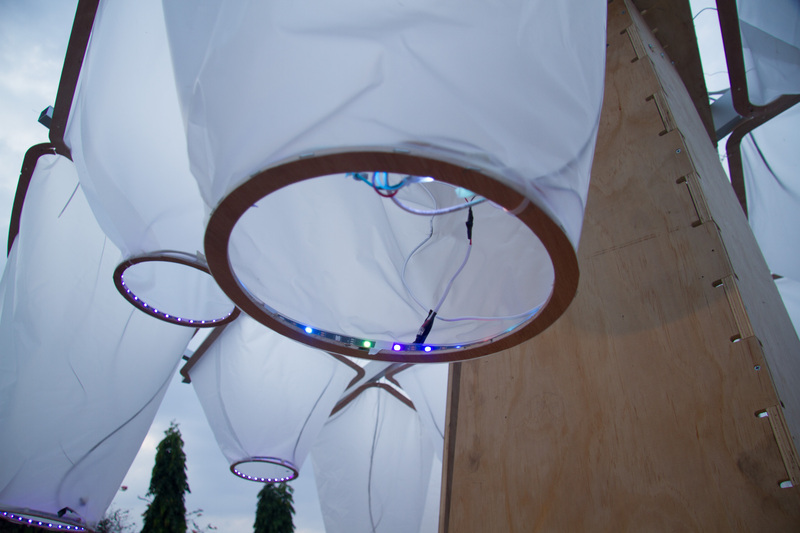 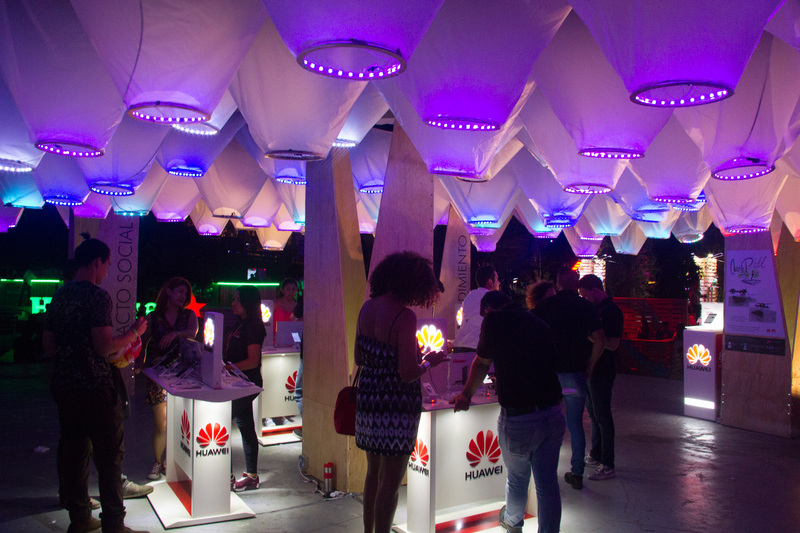 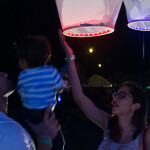 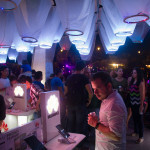 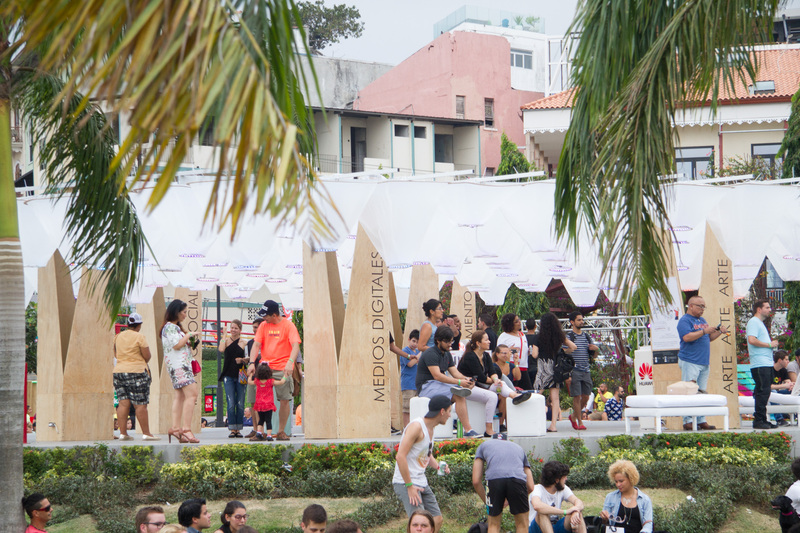 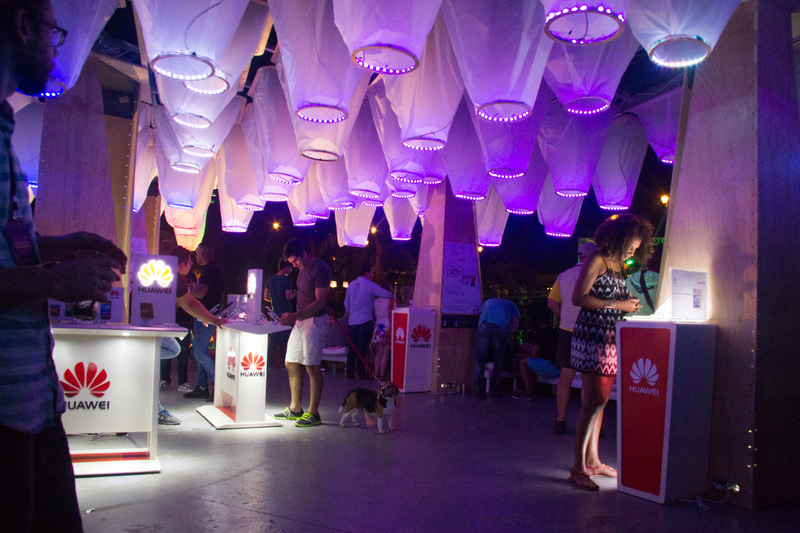 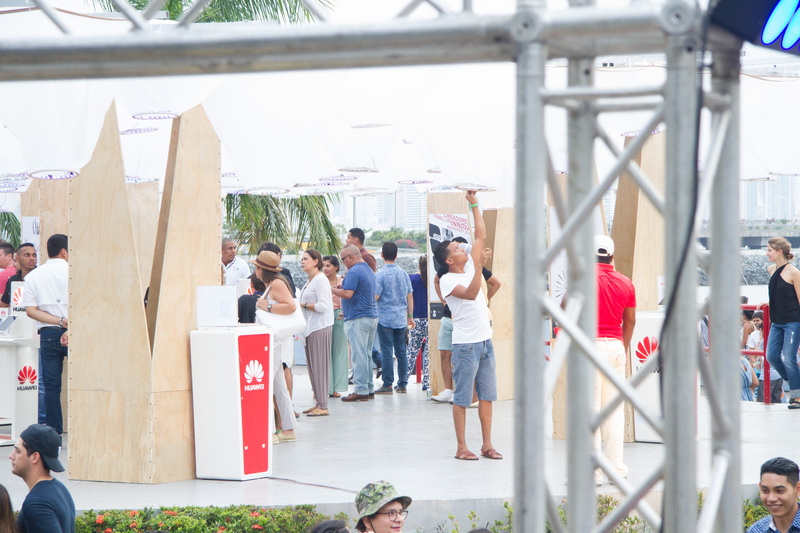 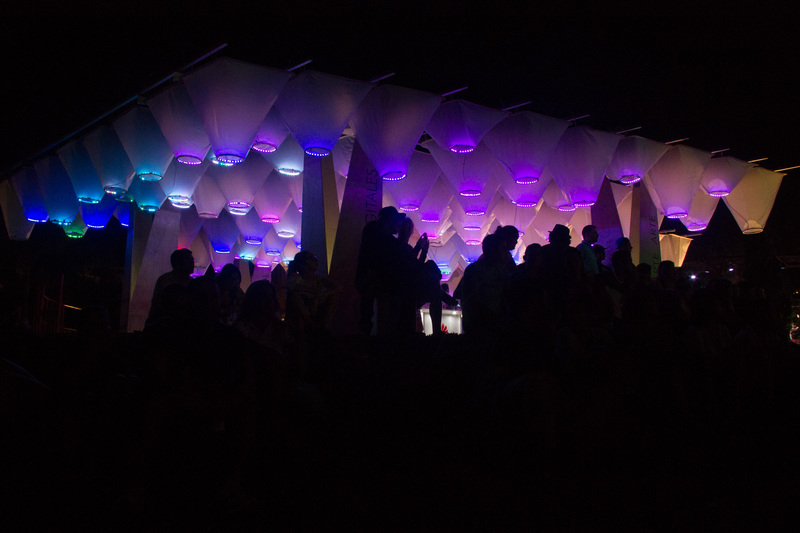 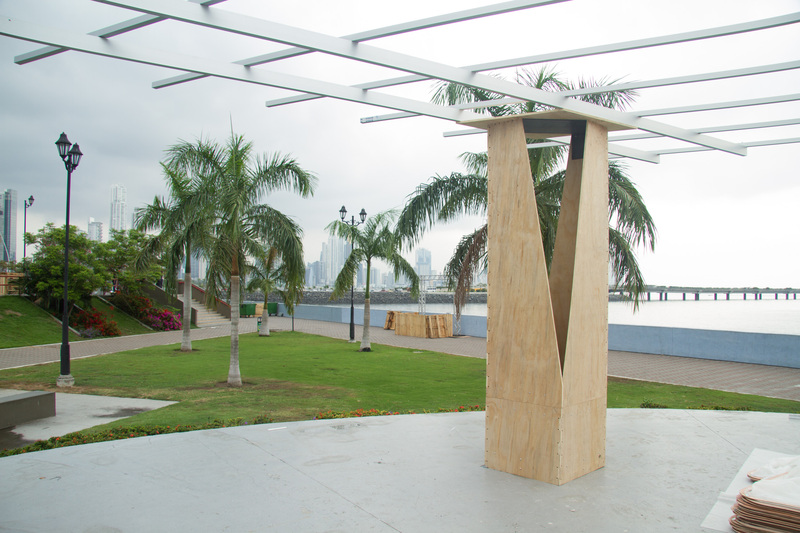 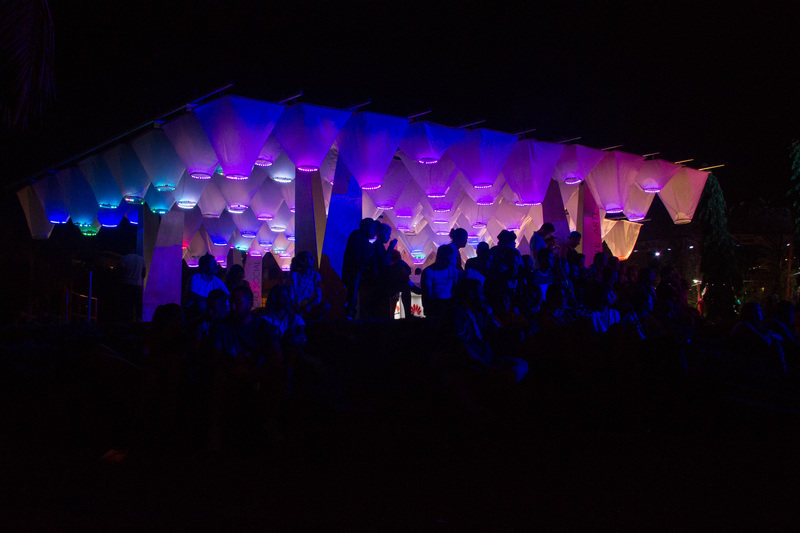 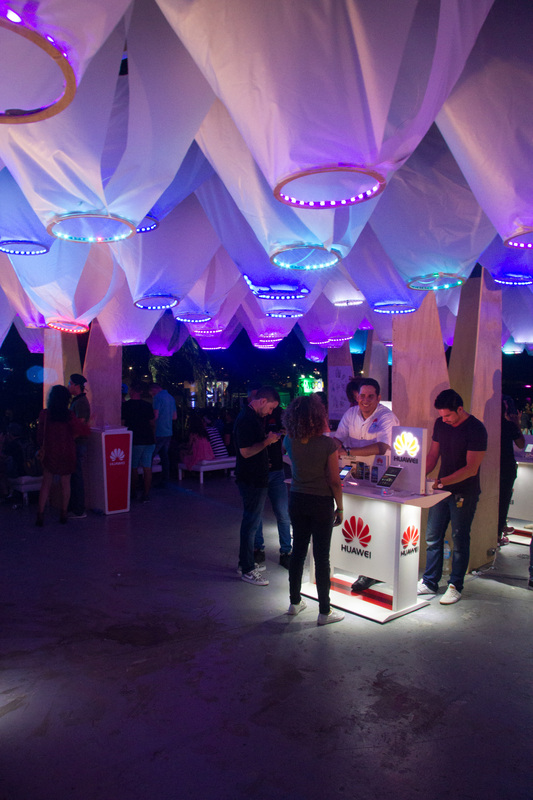 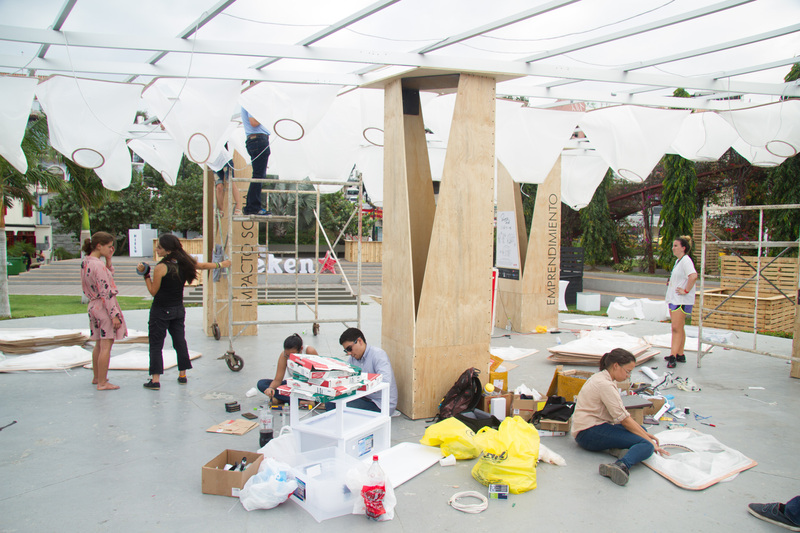 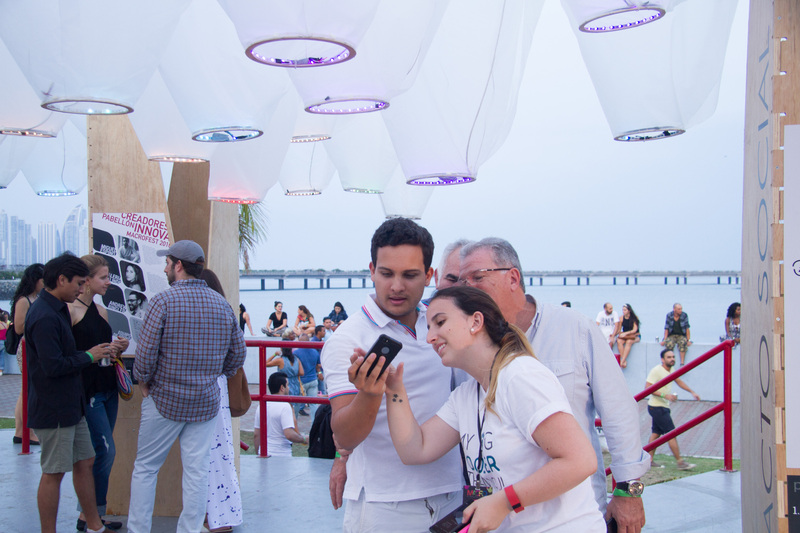 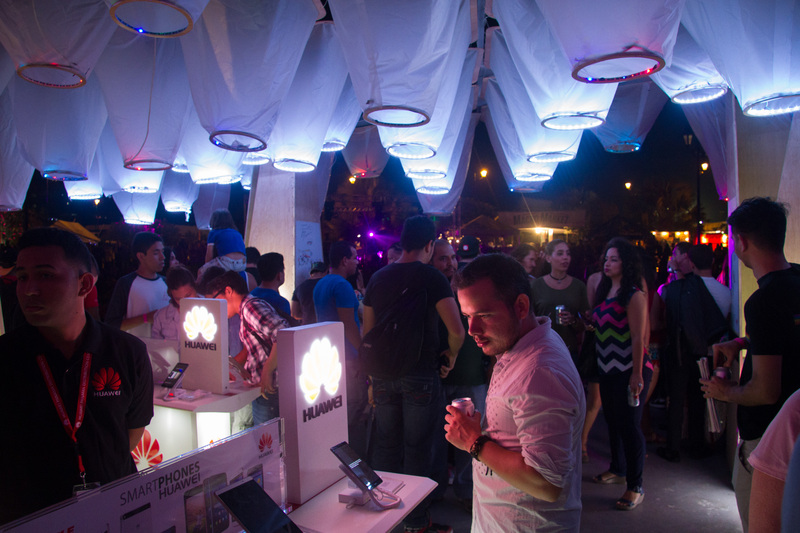 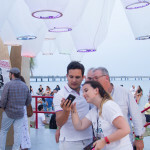 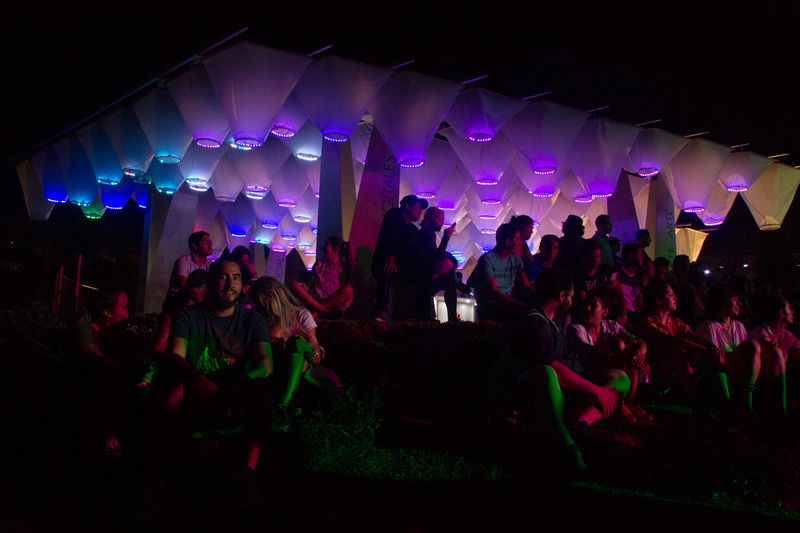 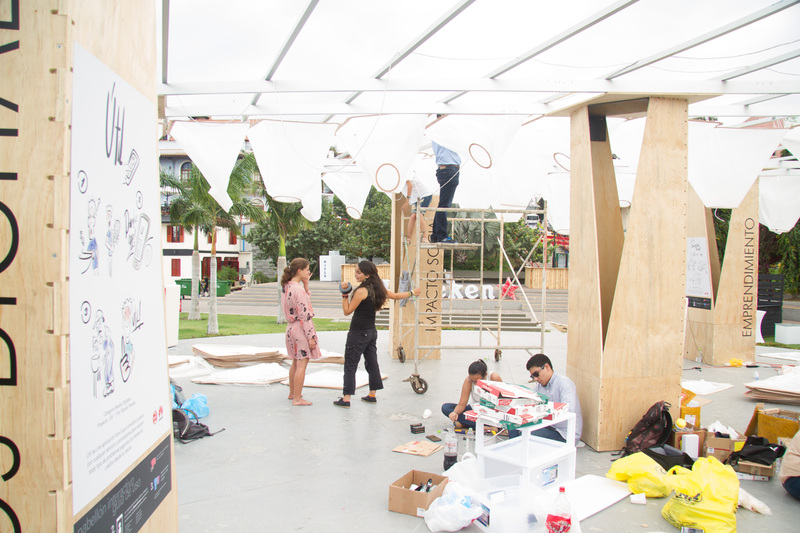 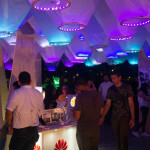 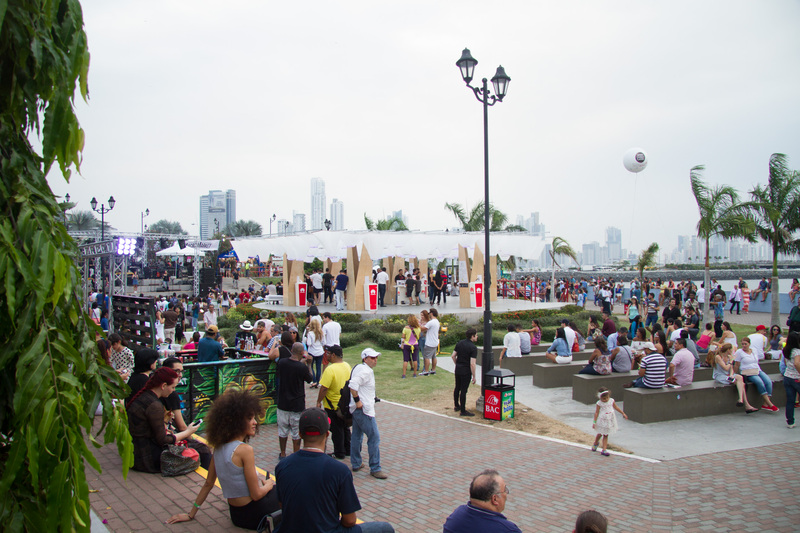 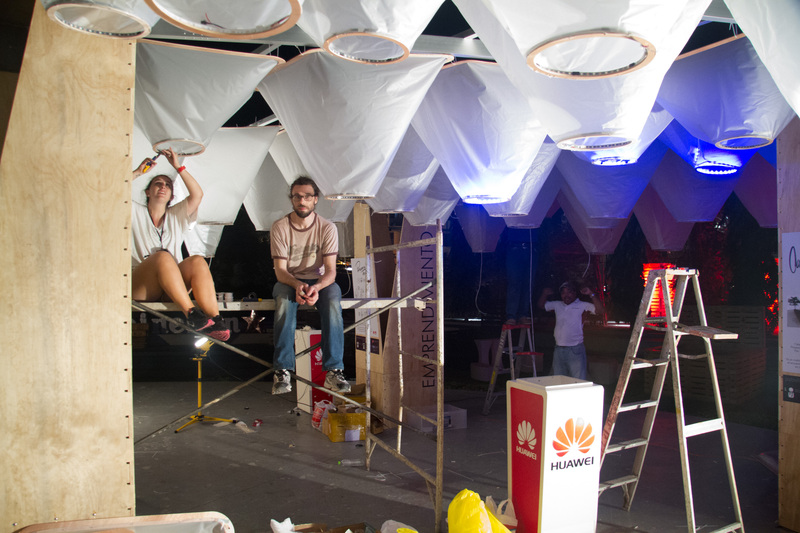 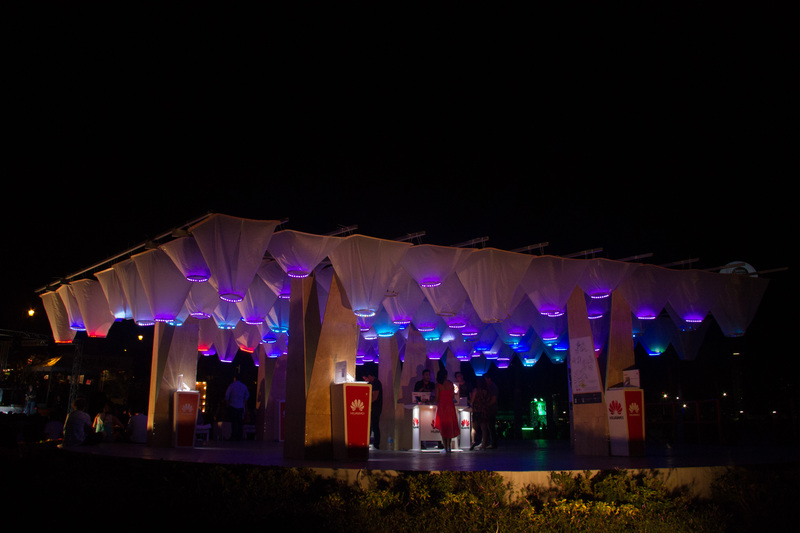 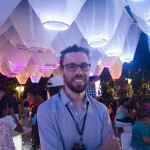 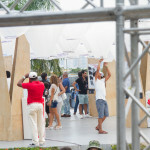 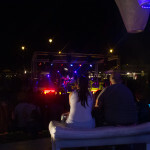 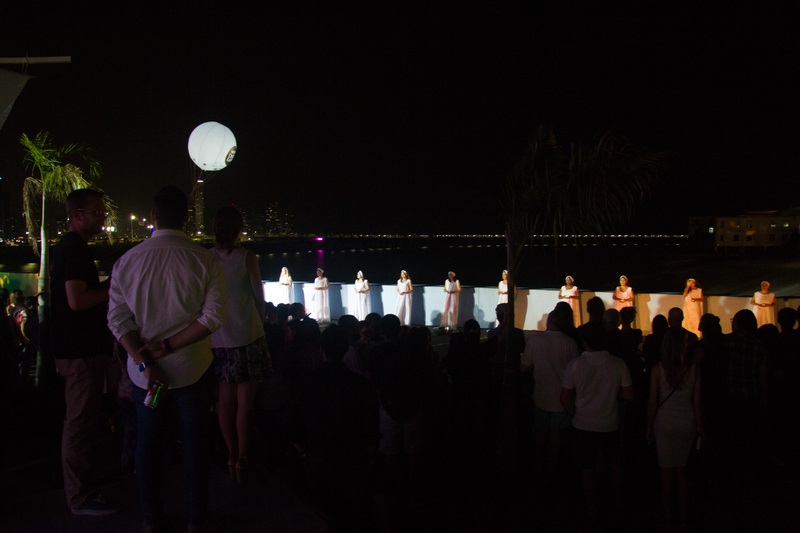 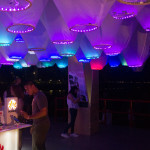 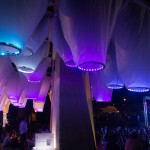 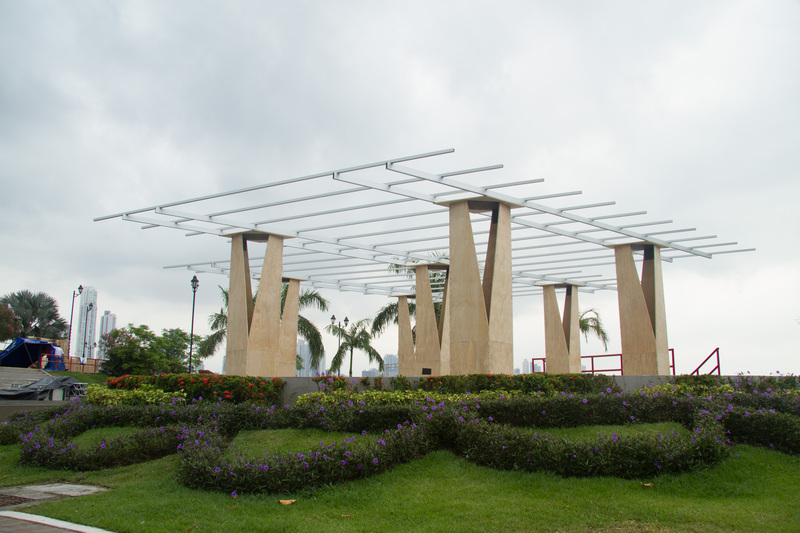 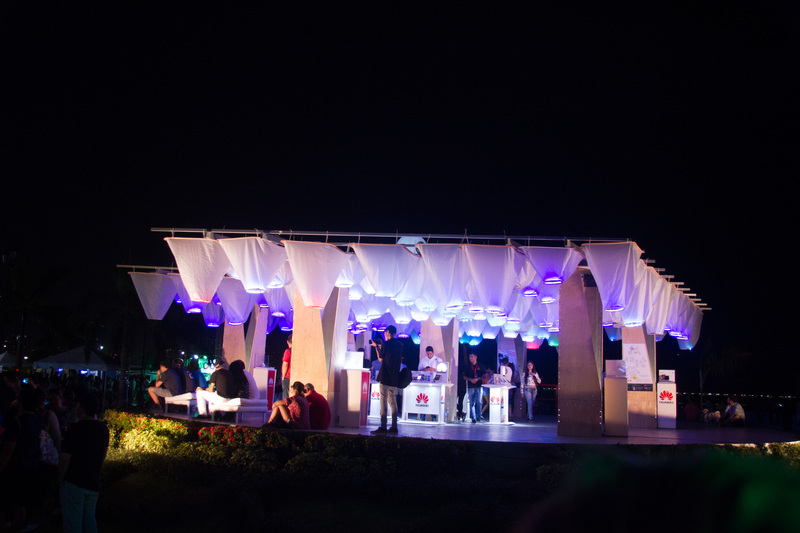 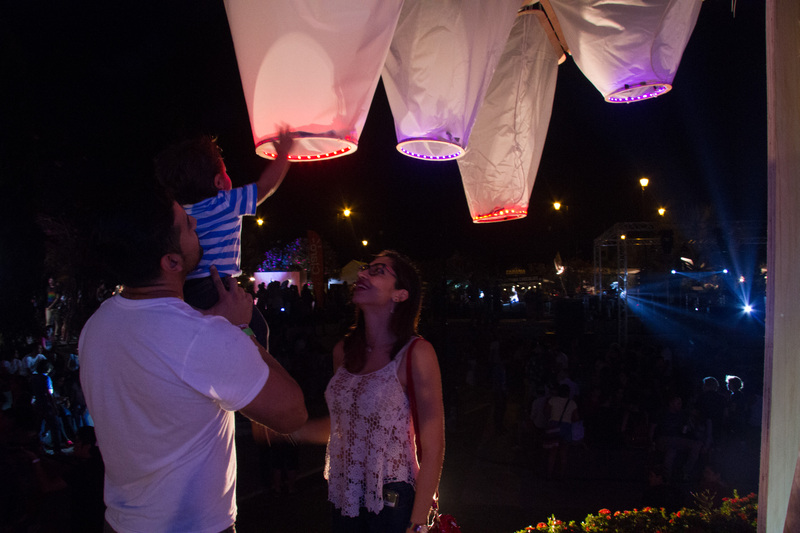 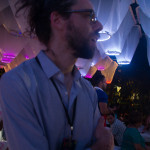 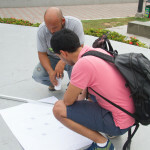 Macropavilion is a public outdoor pavilion providing visitors with shade from the sun as well as an interactive LED light experience in Casco Viejo, Panama. 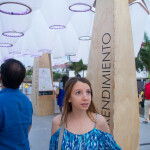 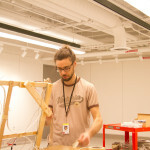 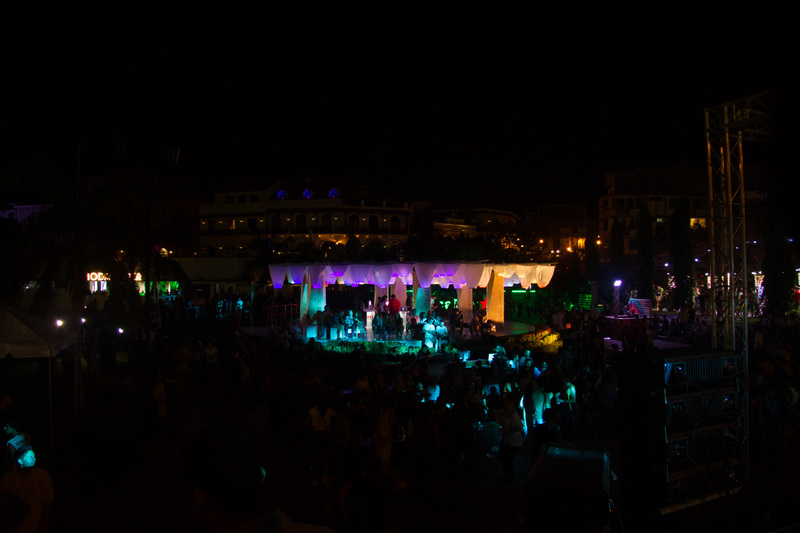 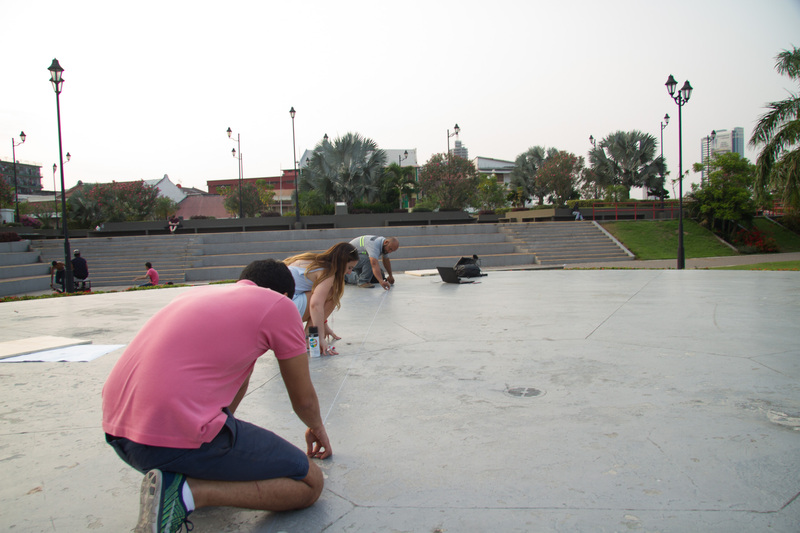 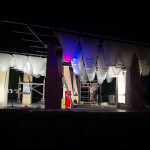 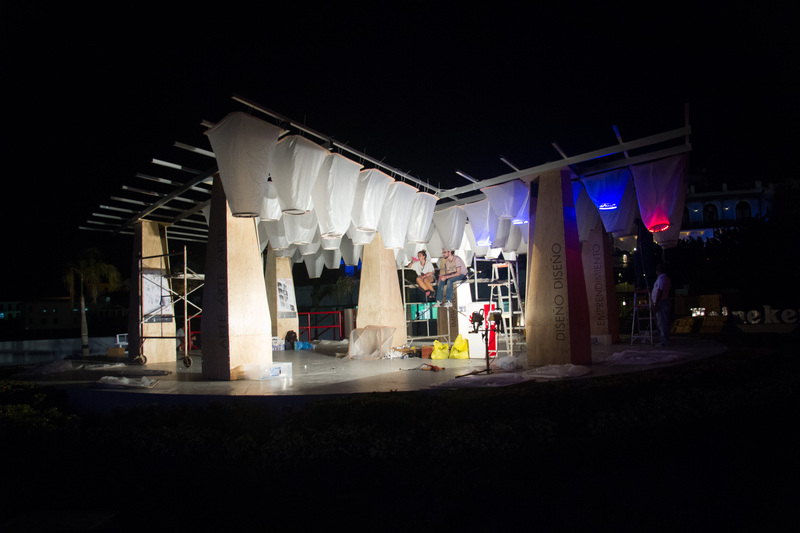 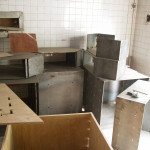 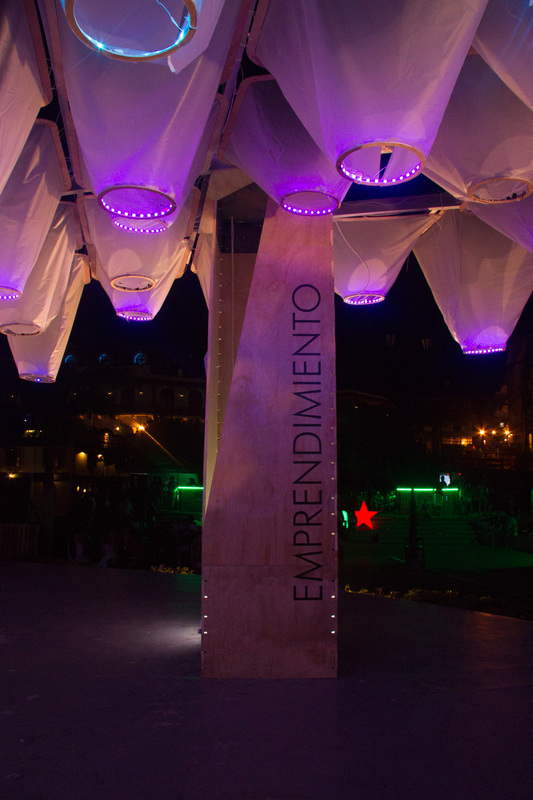 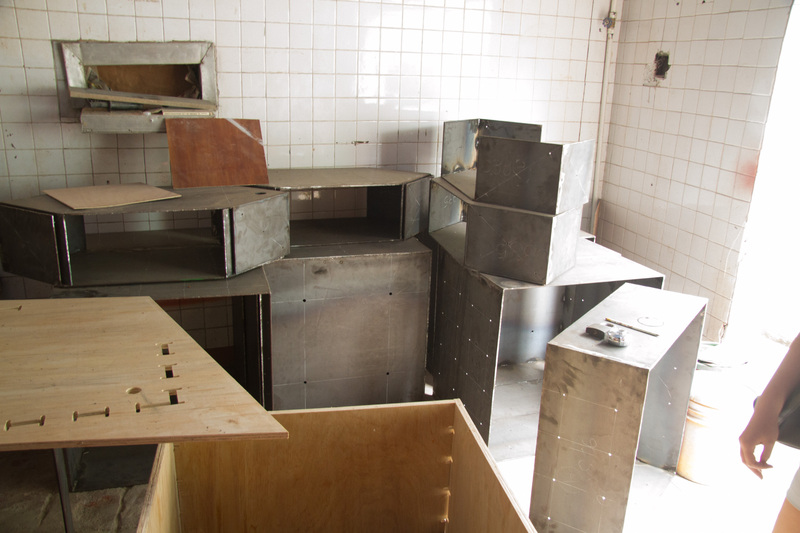 It was the result of a collaboration between myself, Valeria Lalinde, Miguel Espino and the architecture firm Suma Group. 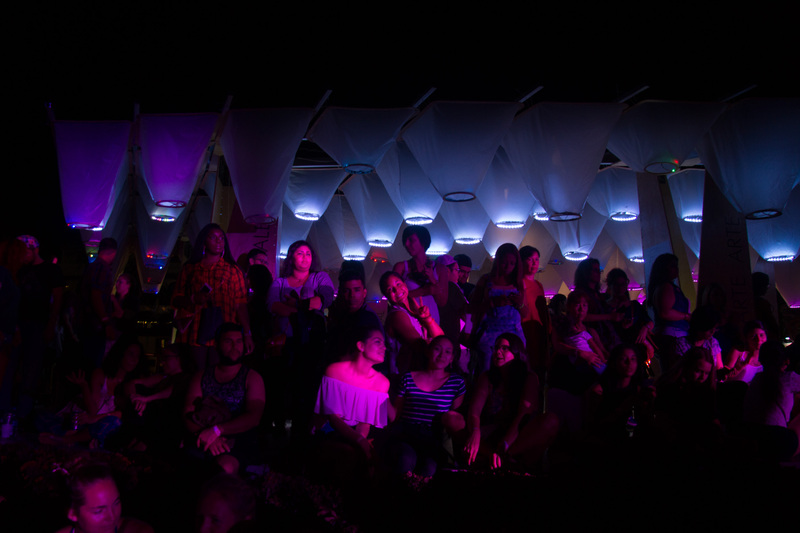 The overall effect for visitors is that of an inviting cave of soft colored lights, providing a cool reprieve from the hot Panama sun. 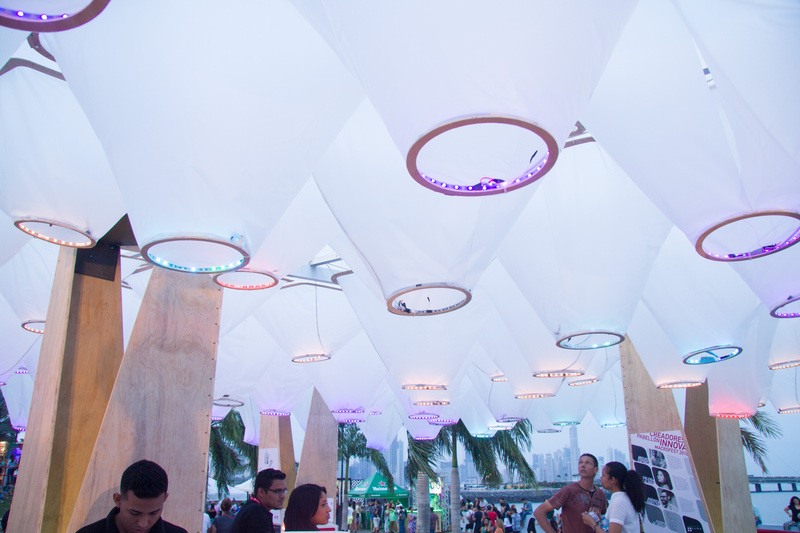 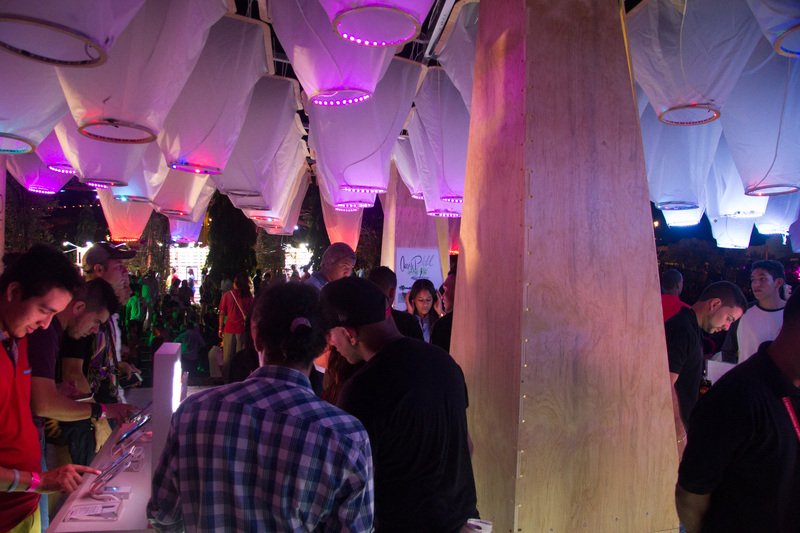 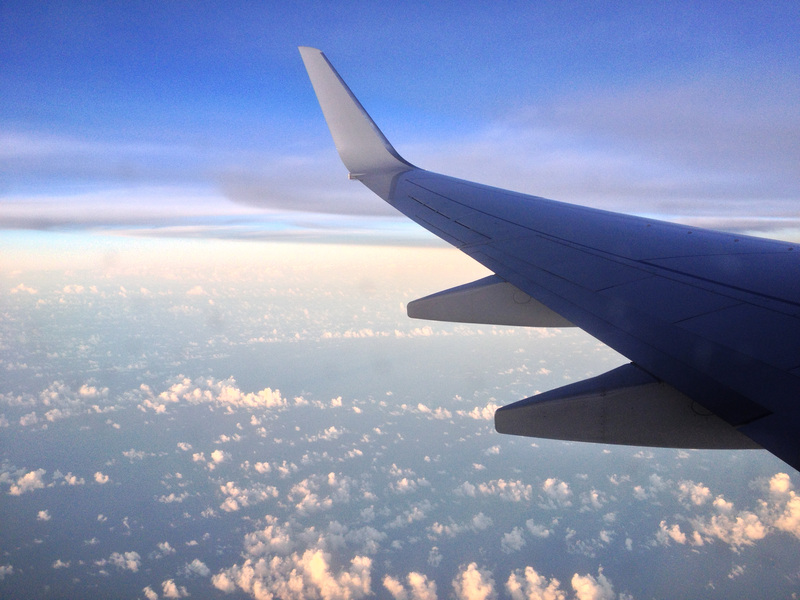 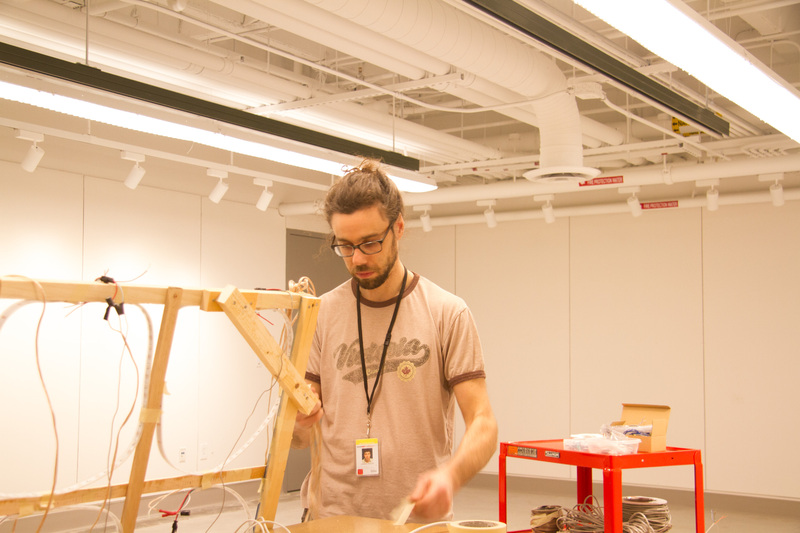 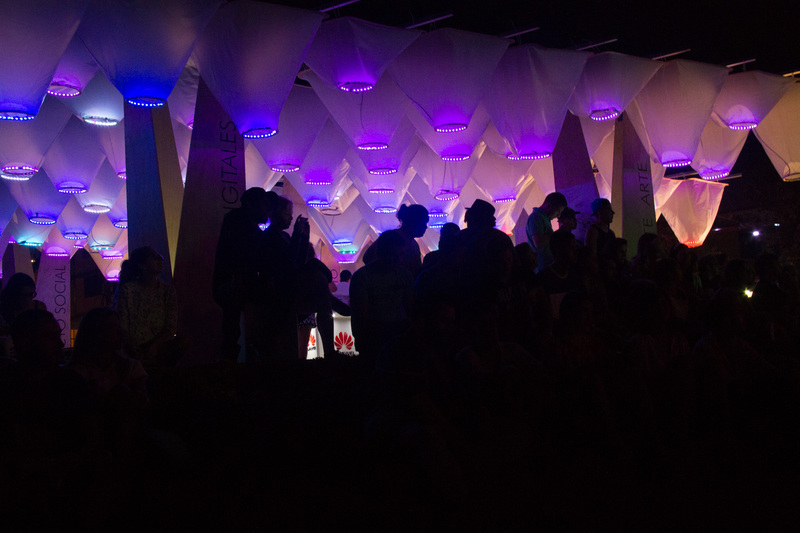 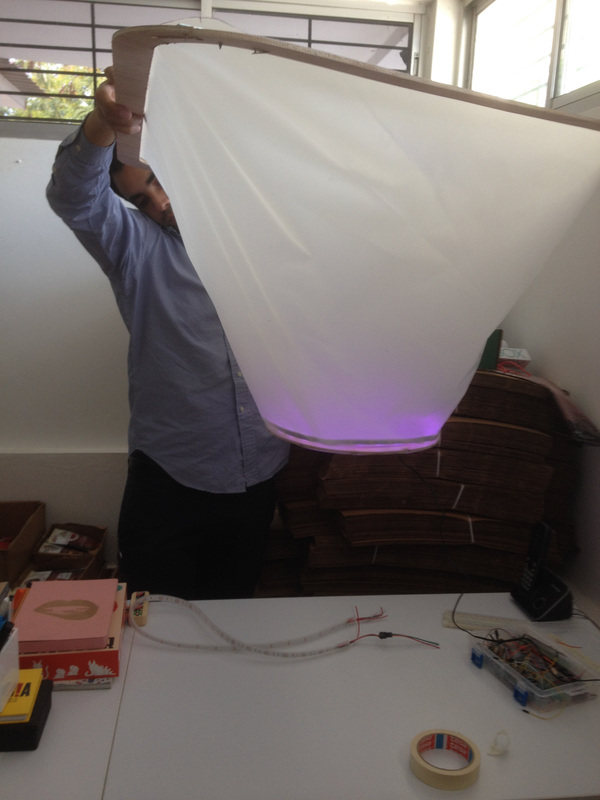 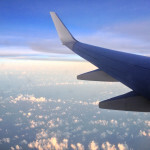 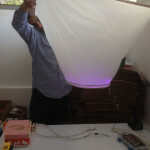 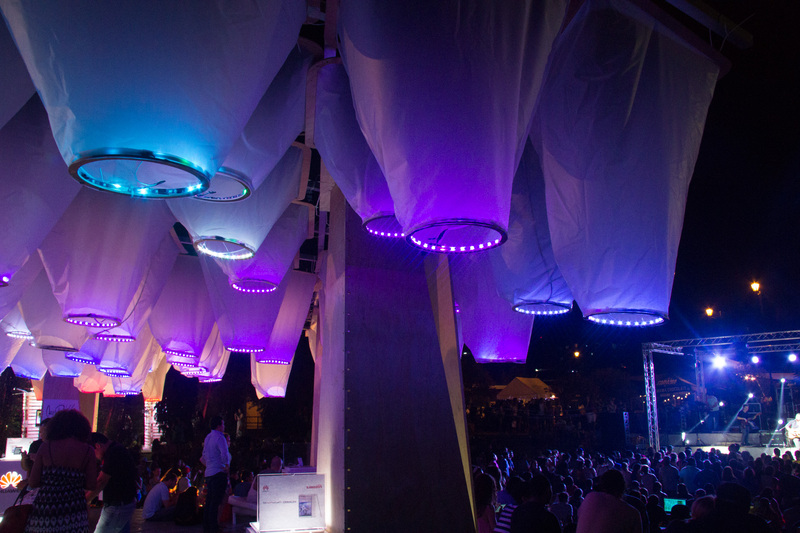 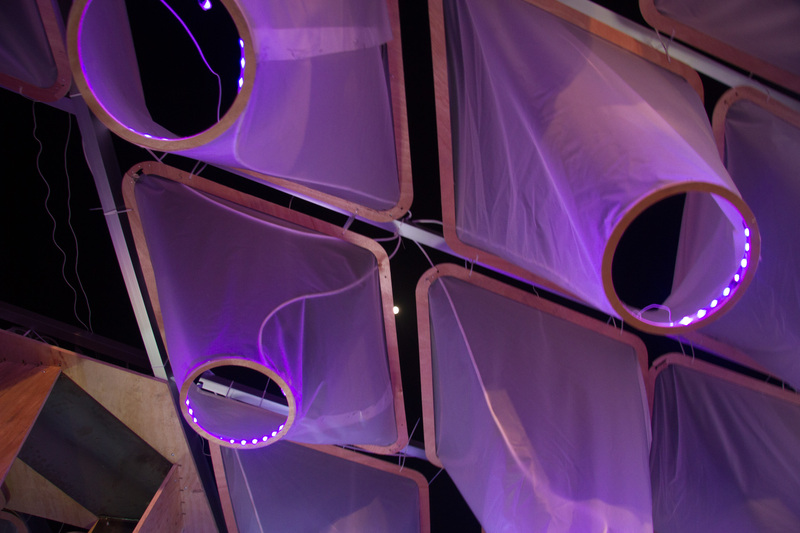 Visitors can touch the fabric causing lights to radiate out. 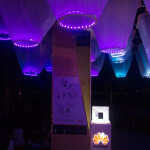 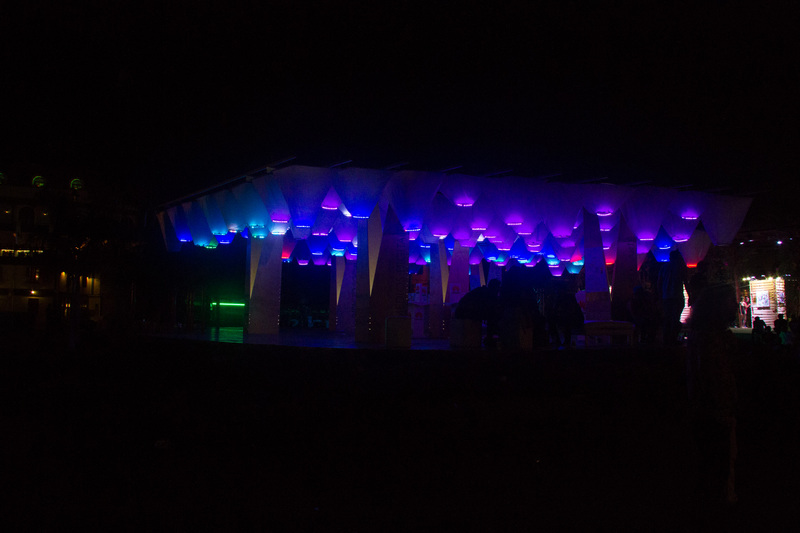 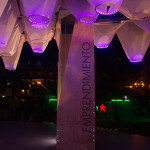 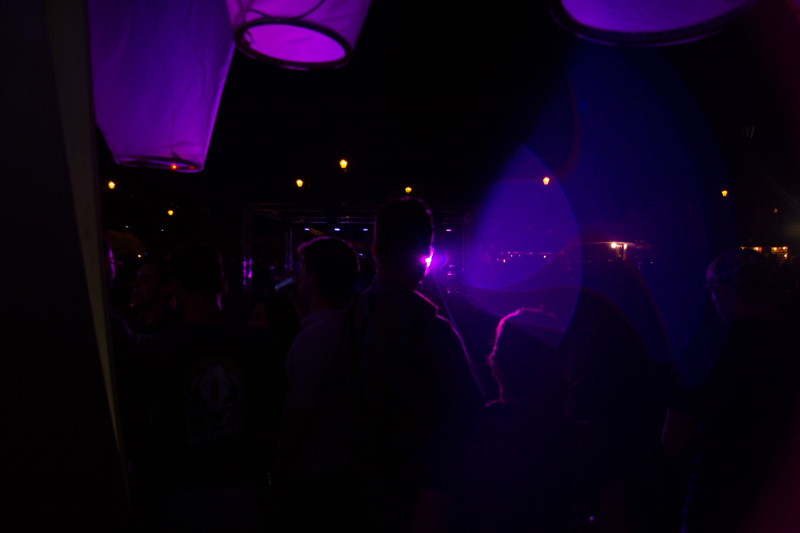 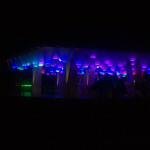 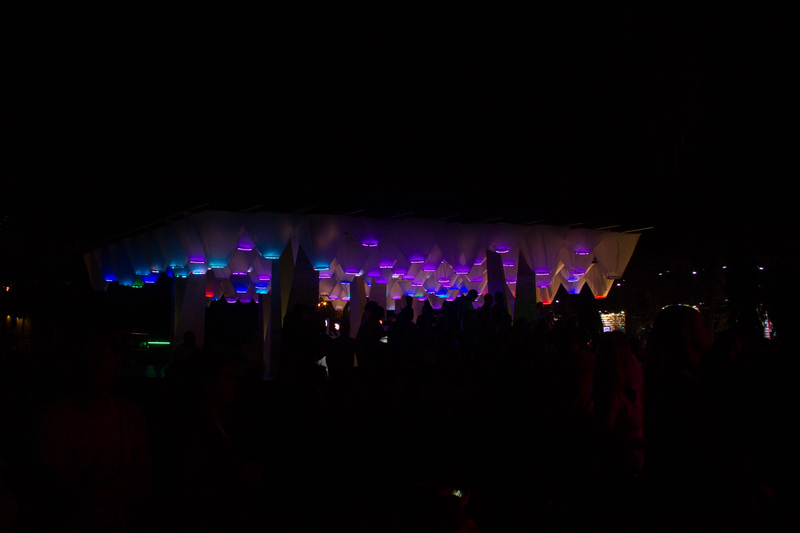 Posting to Instagram with #macroinnova and a color name like “purple” changes the entire color of the pavilion to that color. 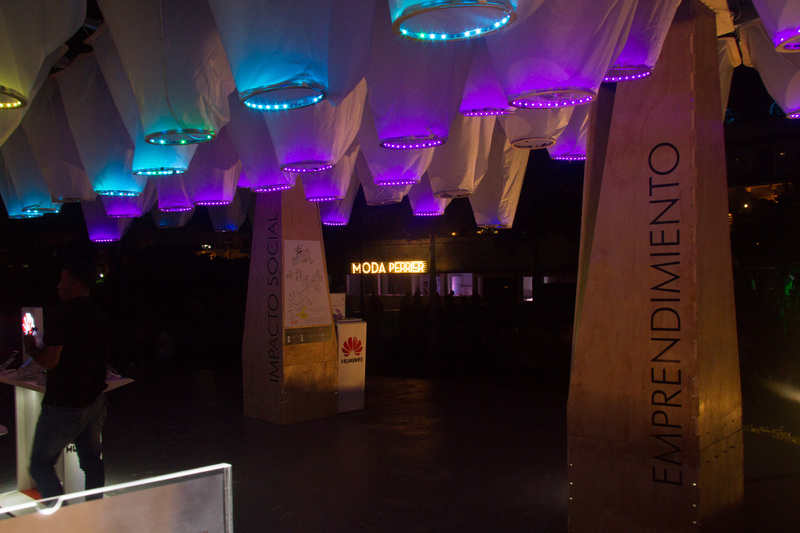 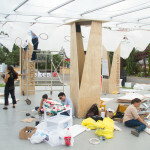 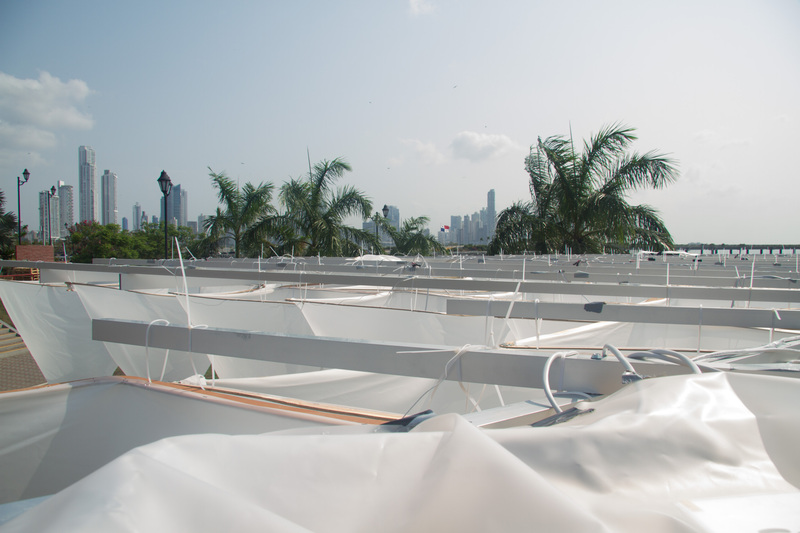 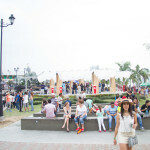 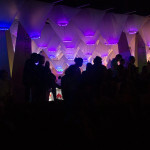 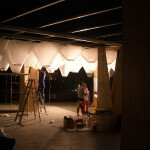 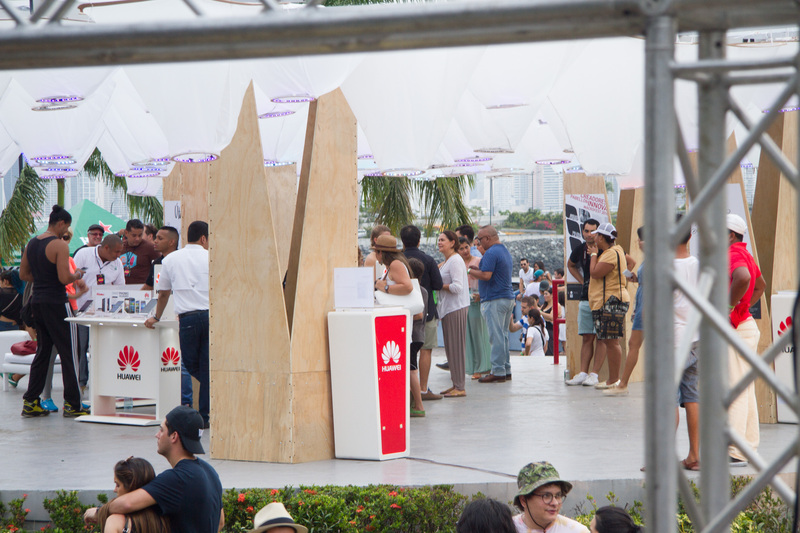 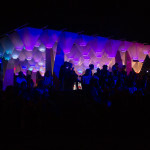 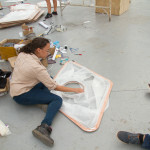 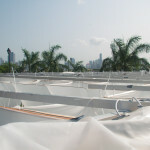 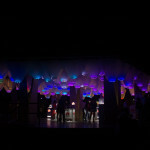 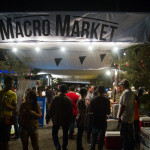 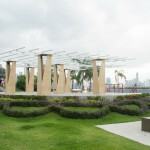 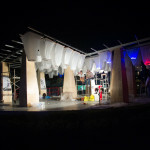 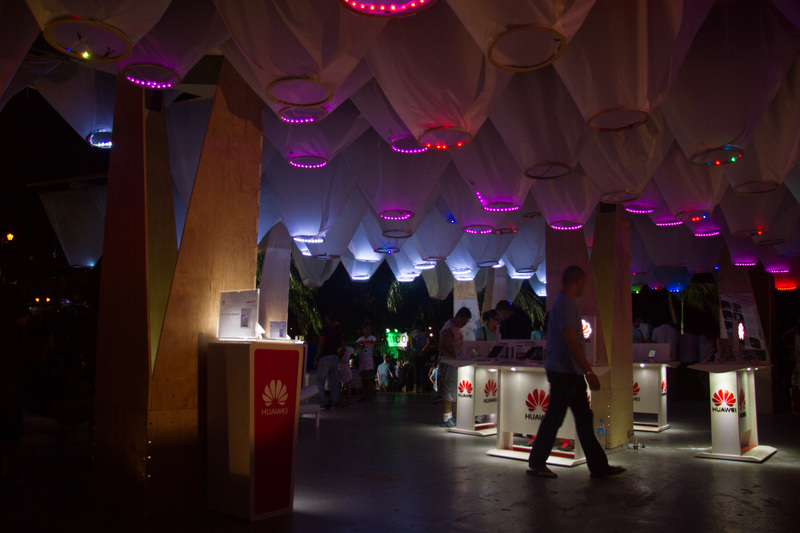 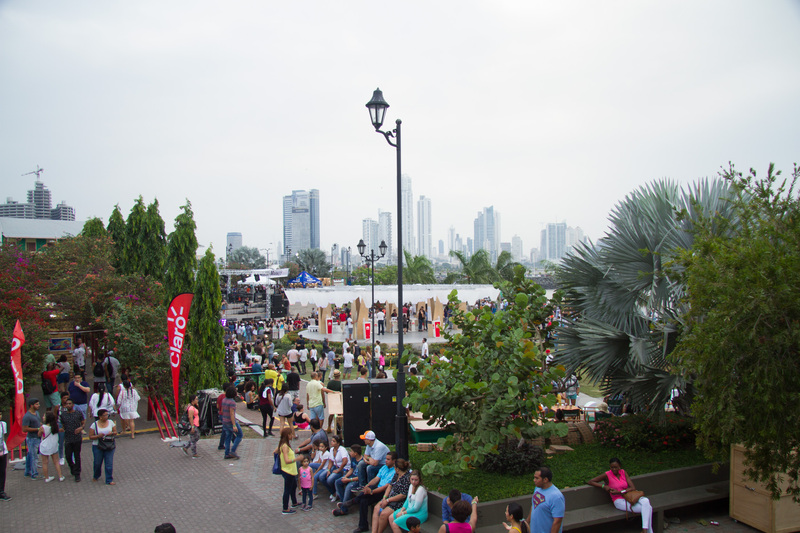 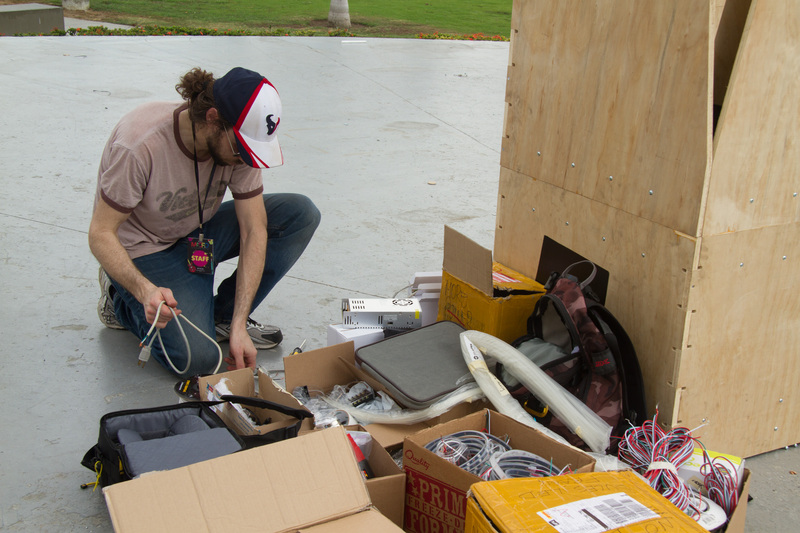 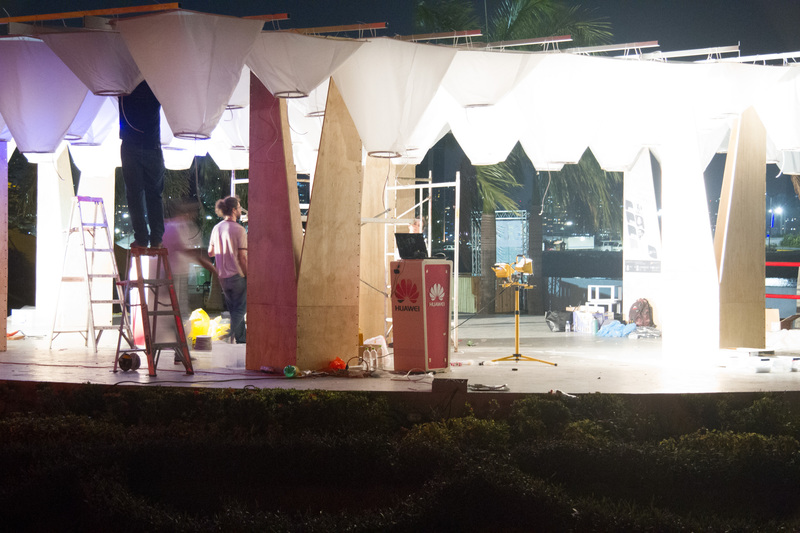 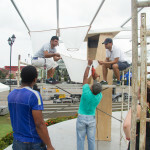 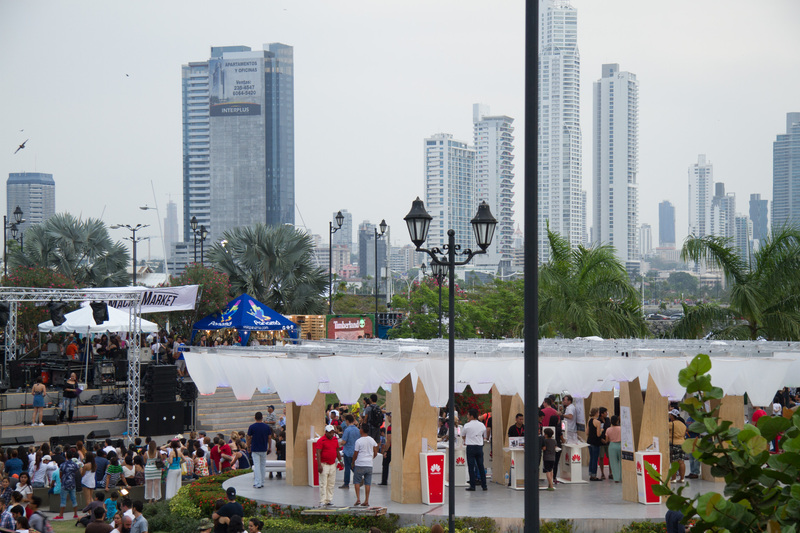 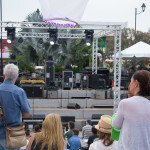 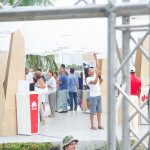 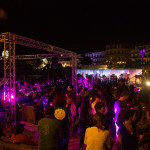 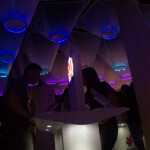 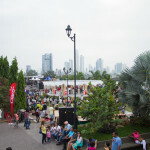 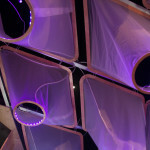 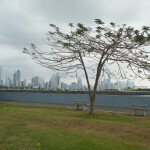 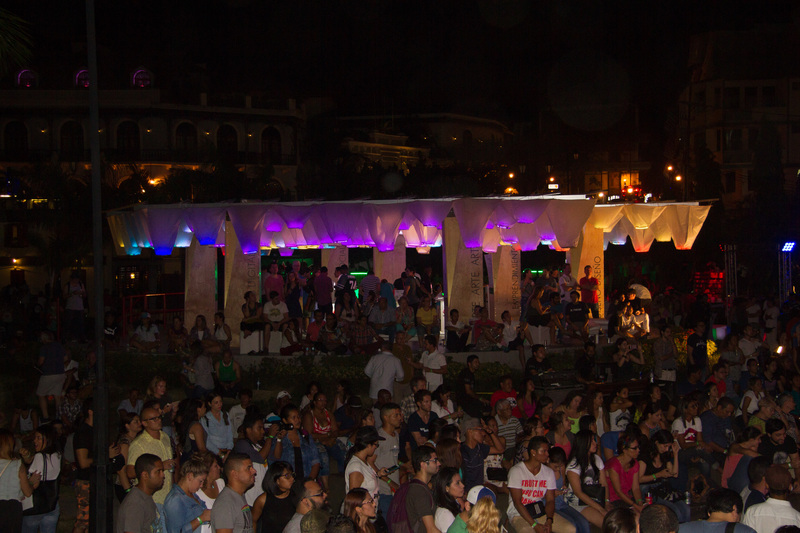 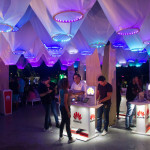 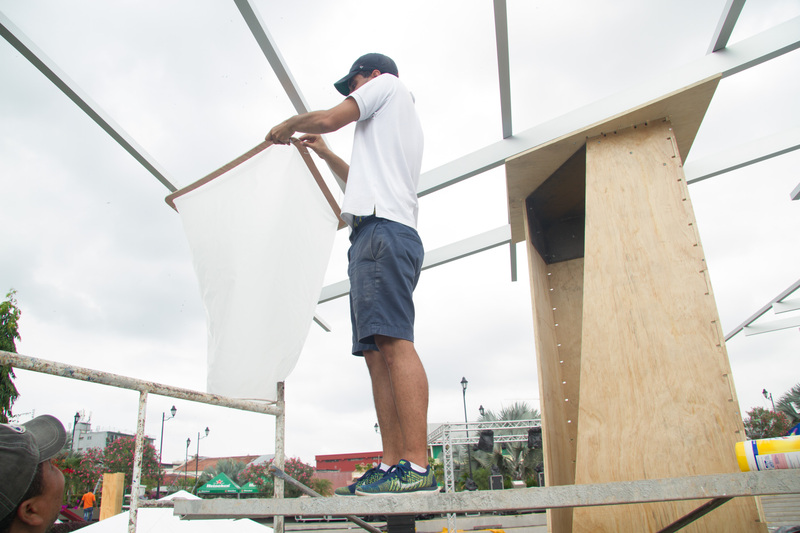 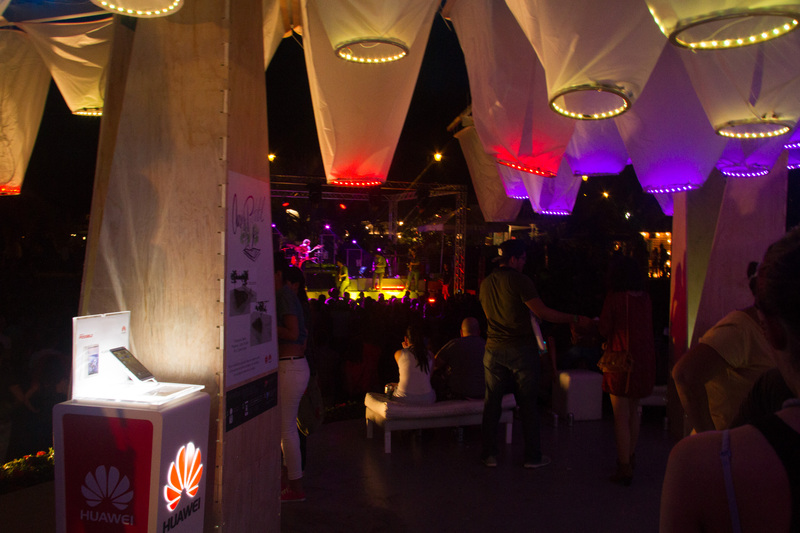 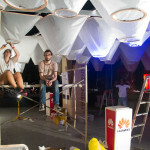 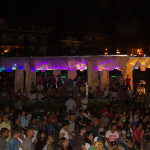 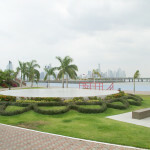 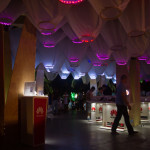 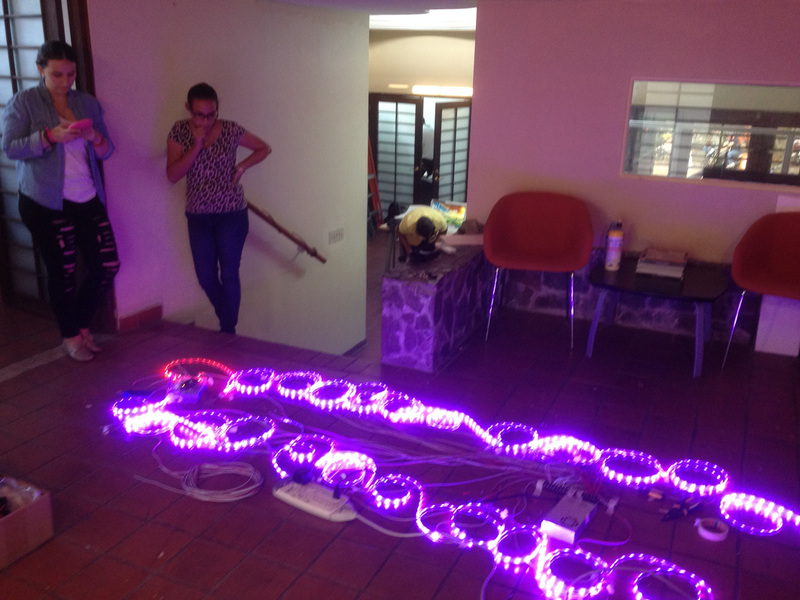 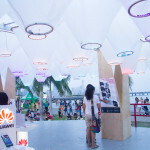 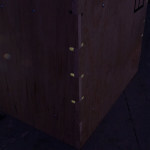 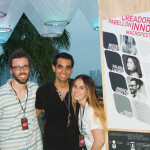 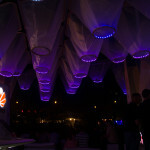 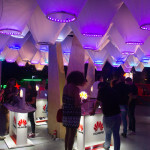 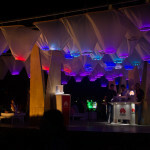 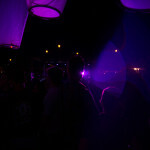 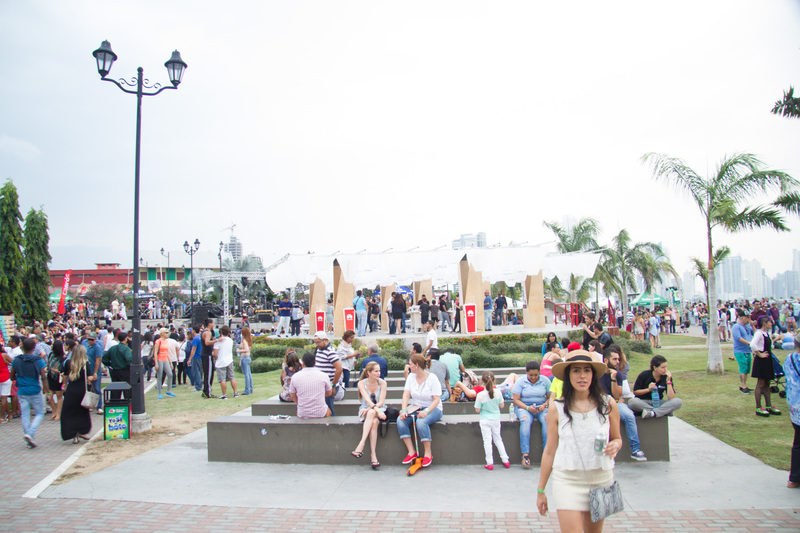 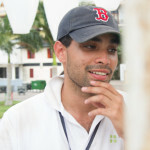 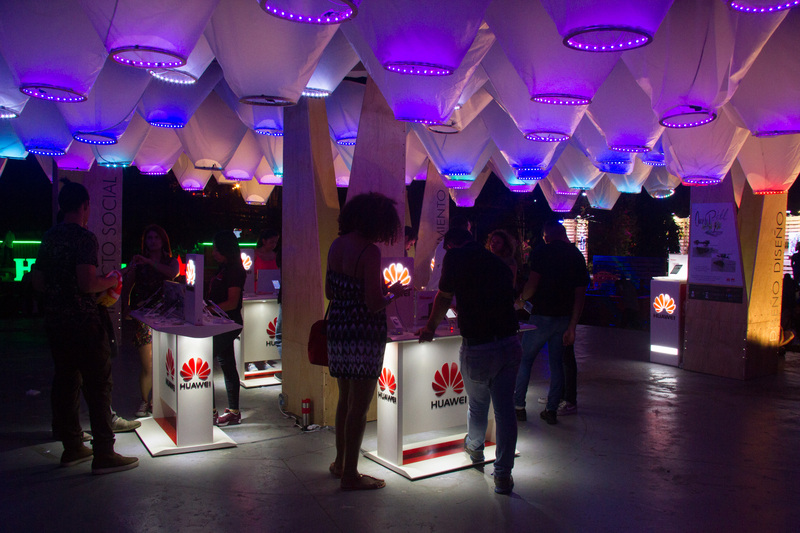 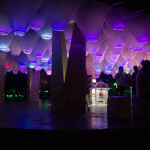 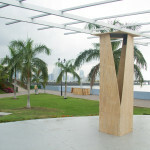 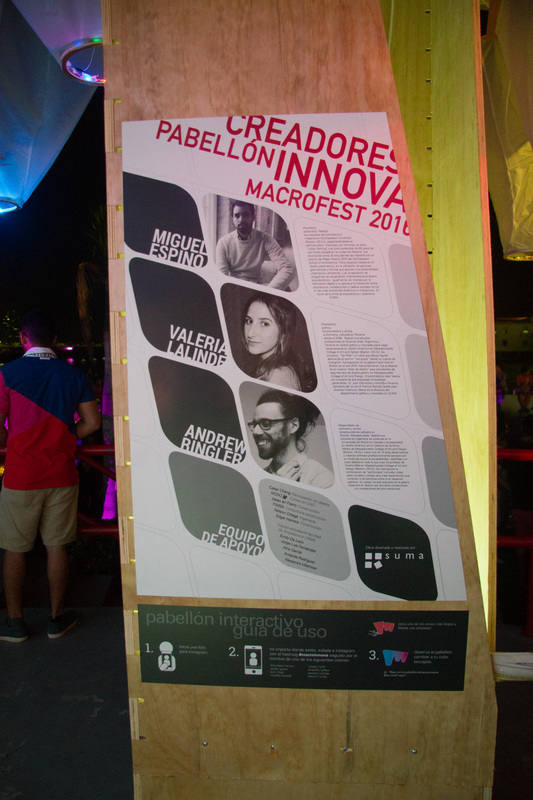 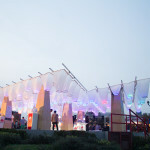 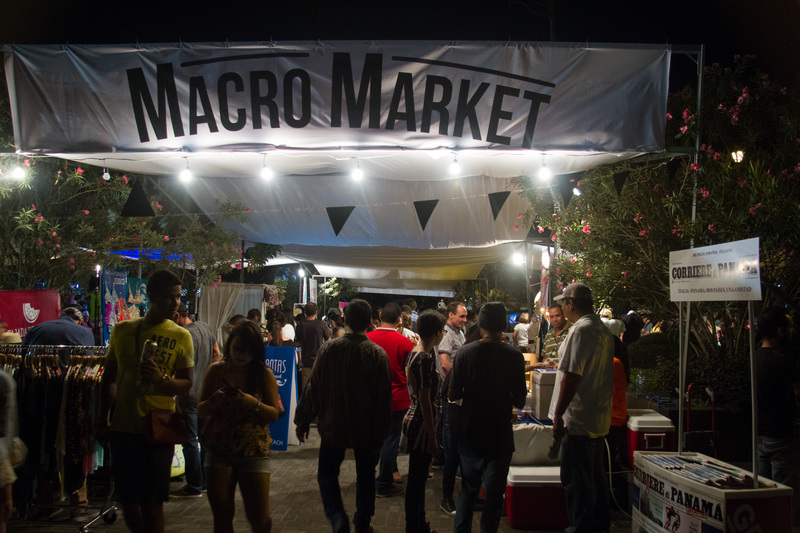 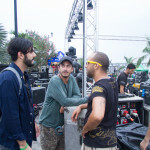 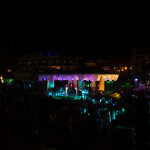 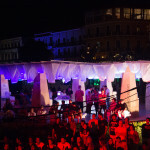 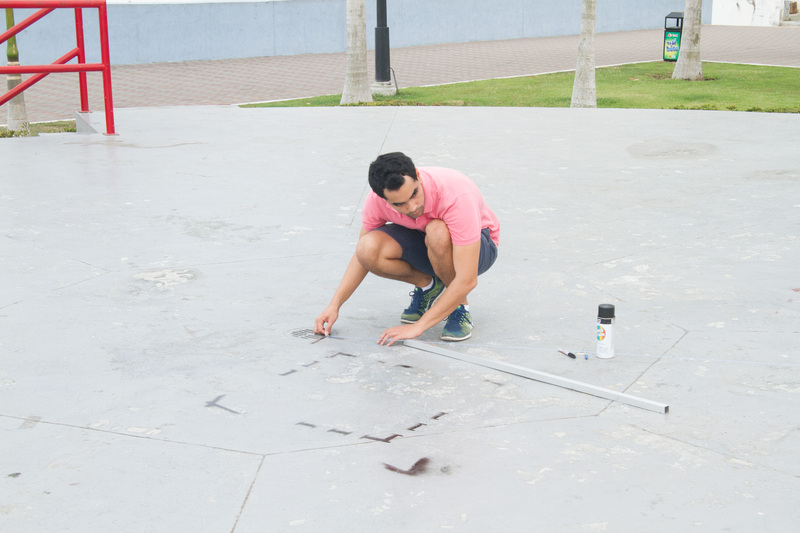 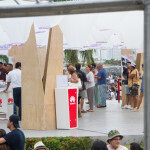 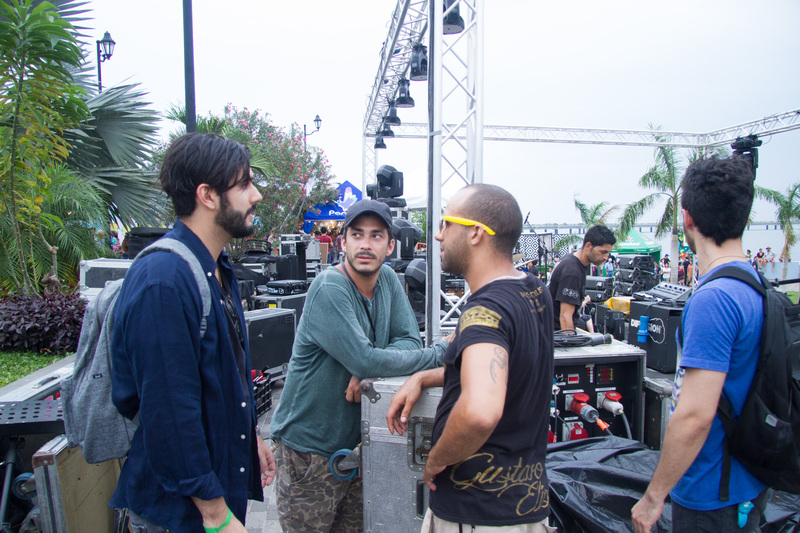 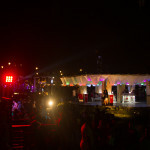 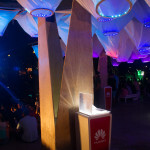 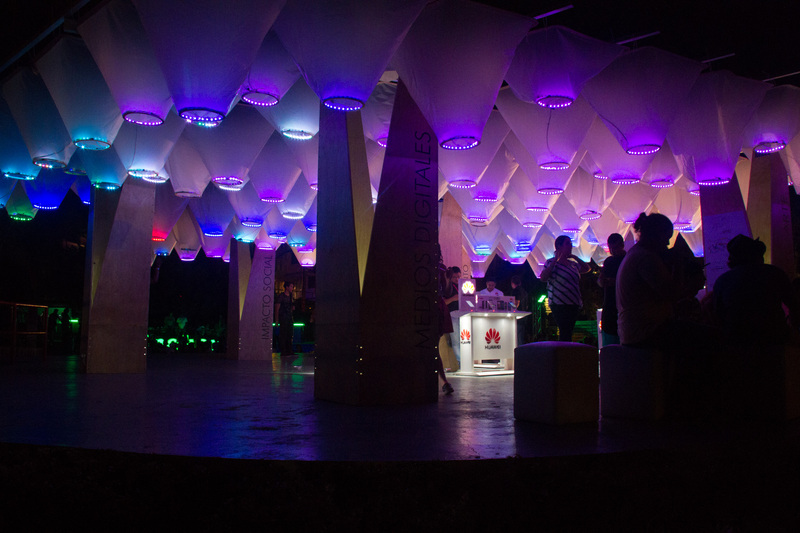 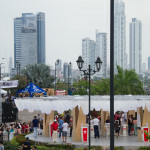 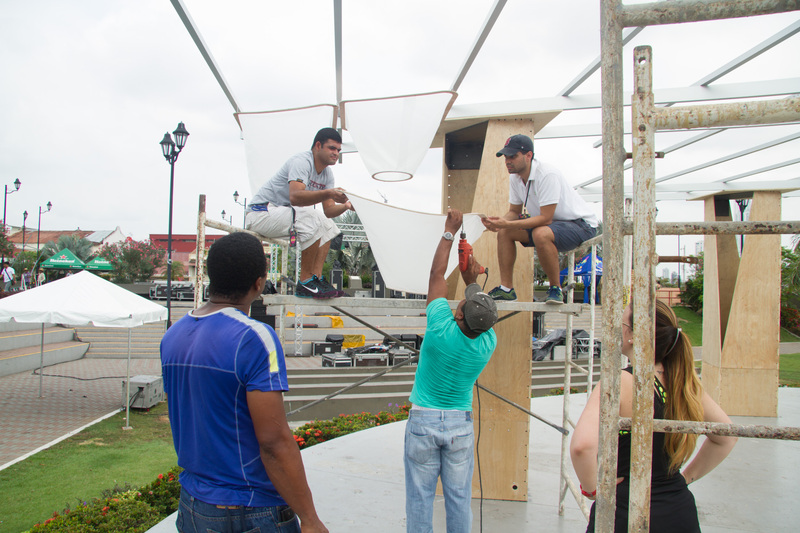 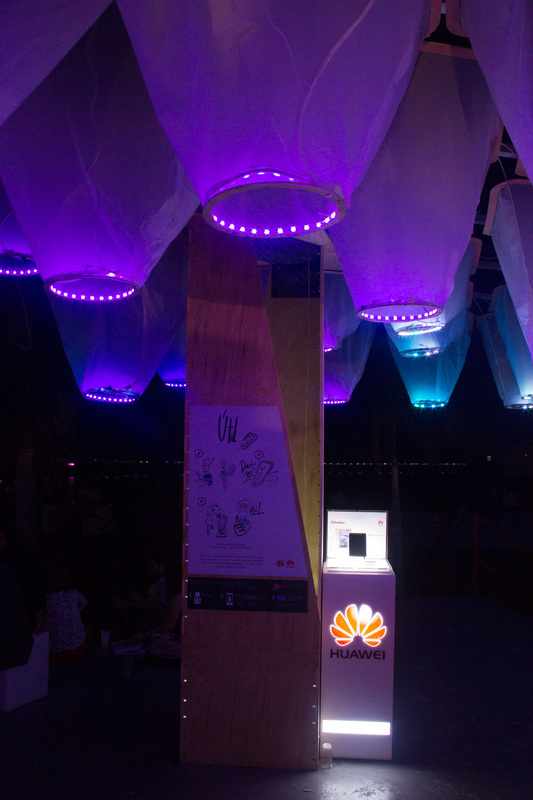 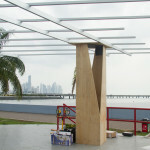 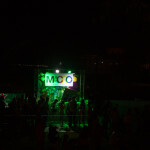 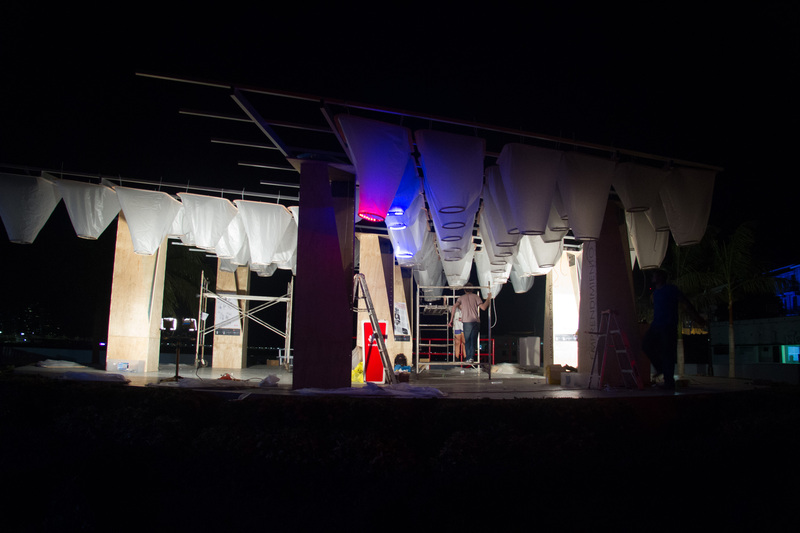 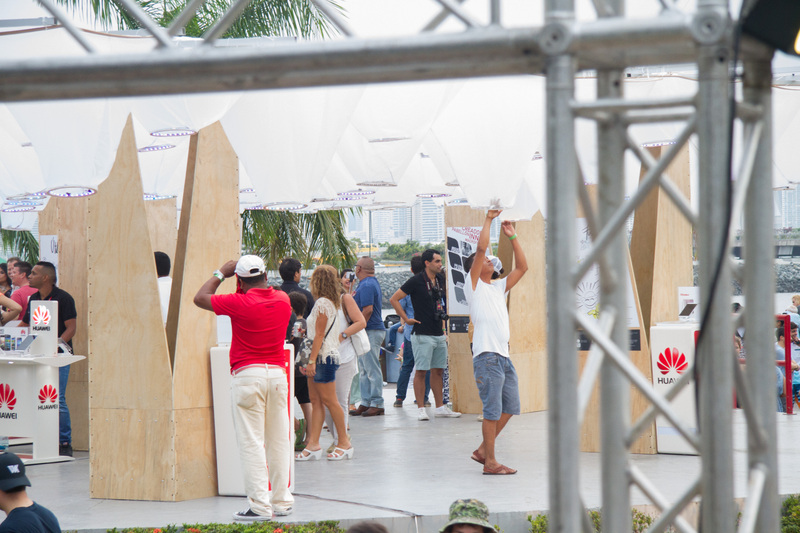 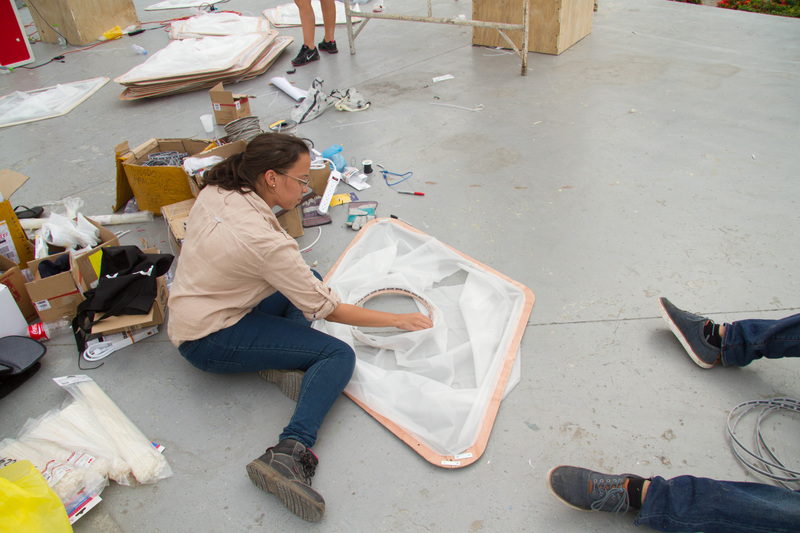 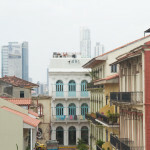 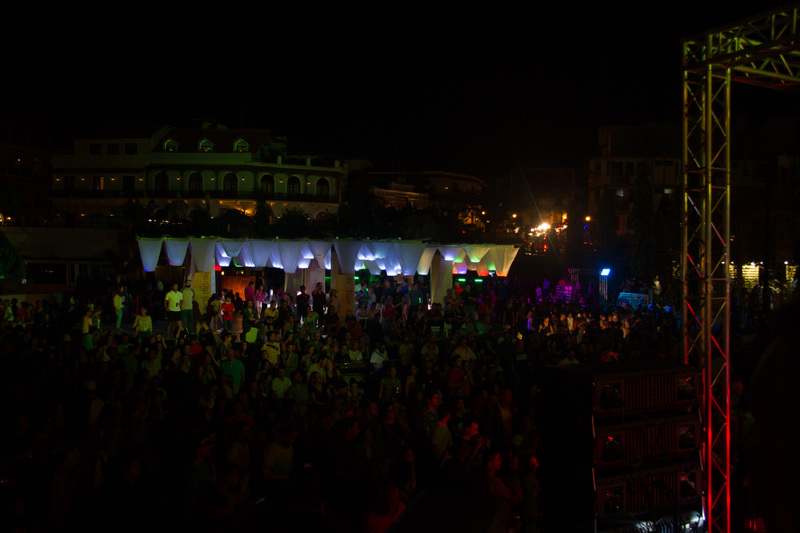 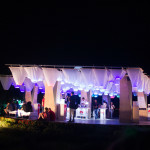 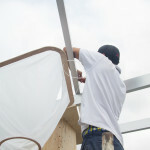 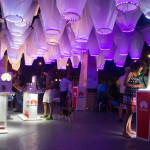 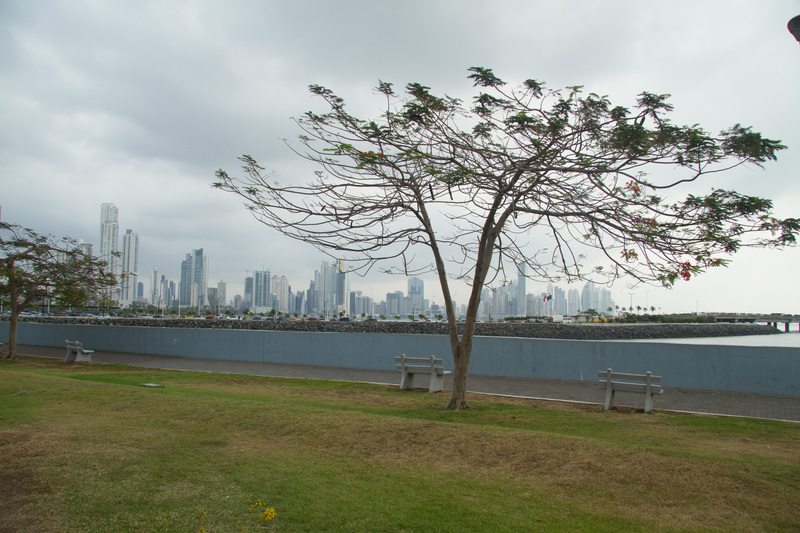 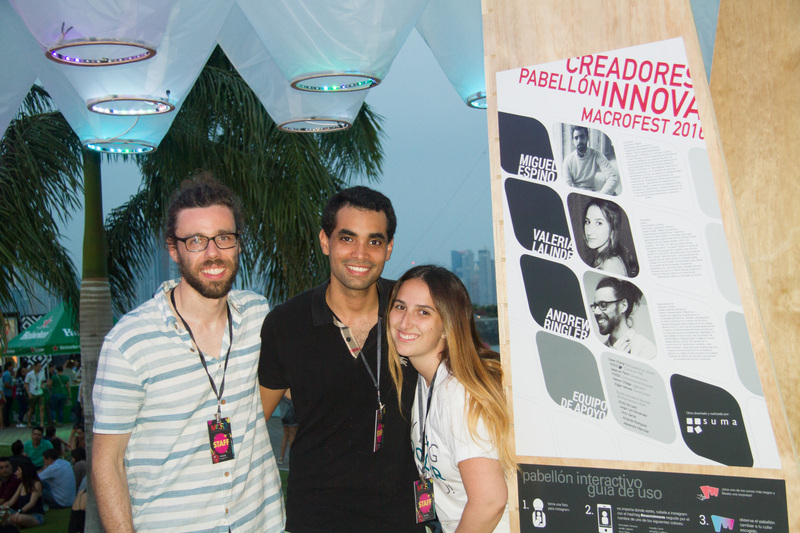 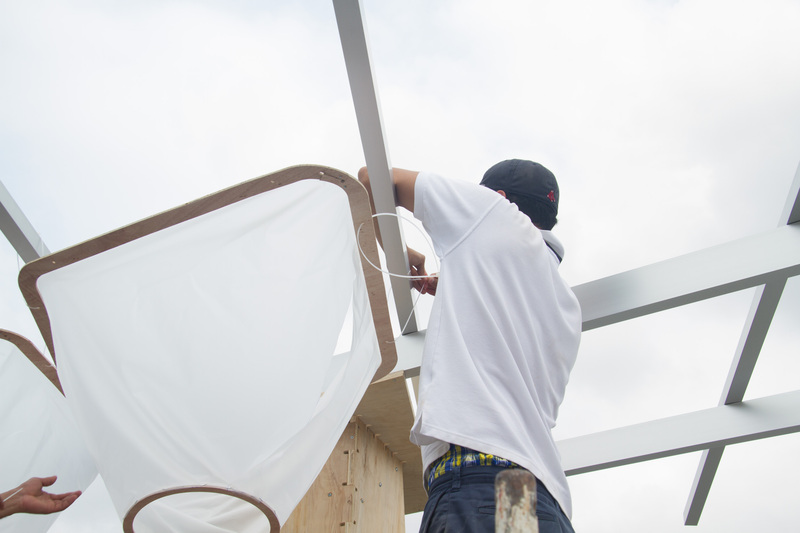 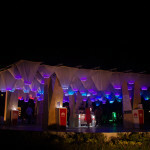 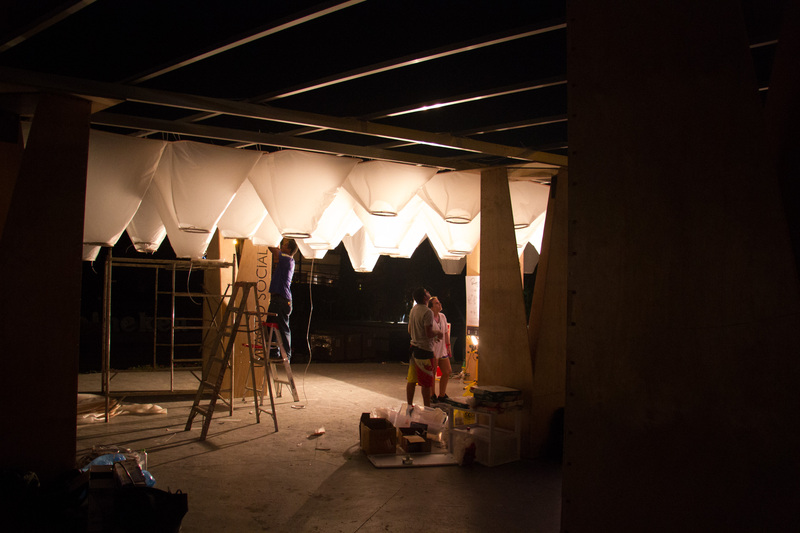 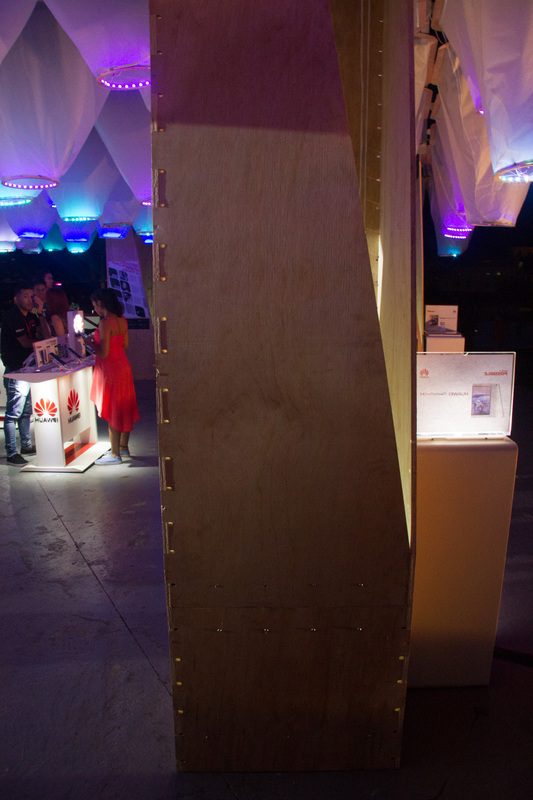 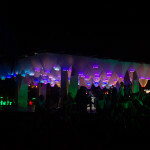 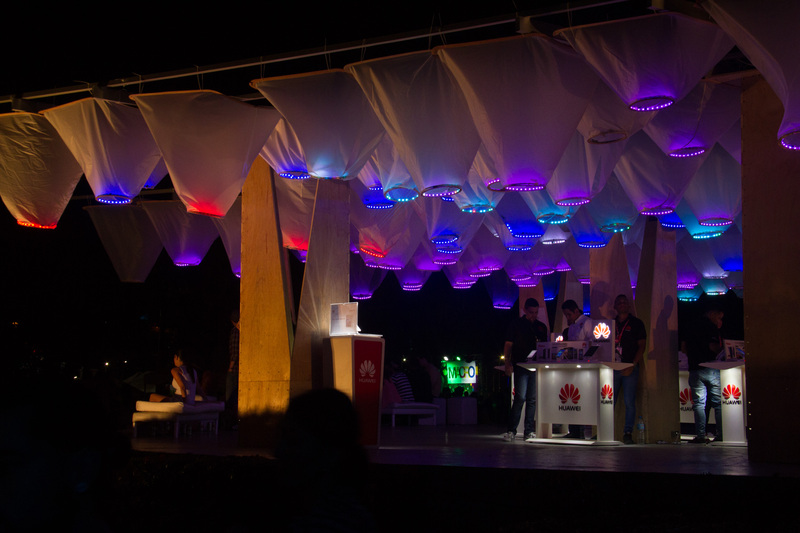 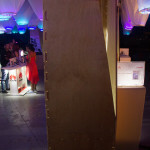 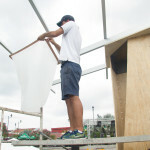 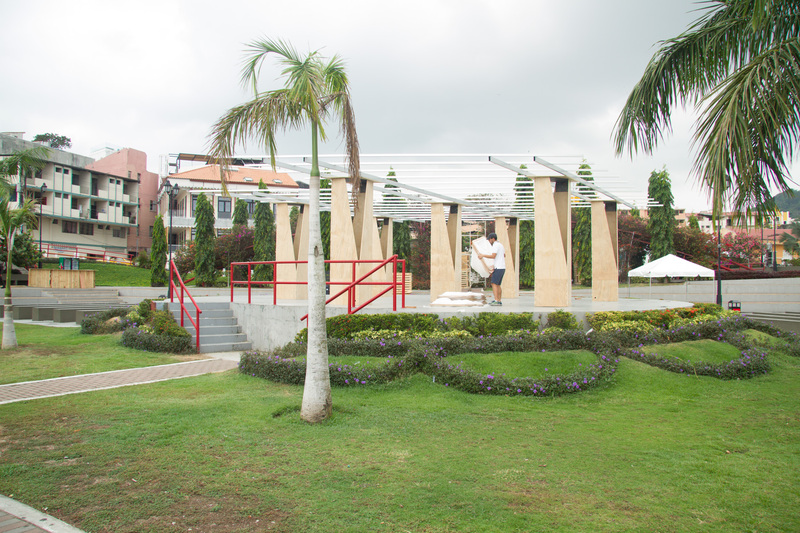 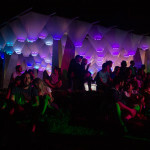 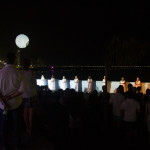 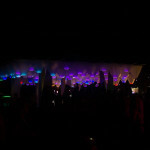 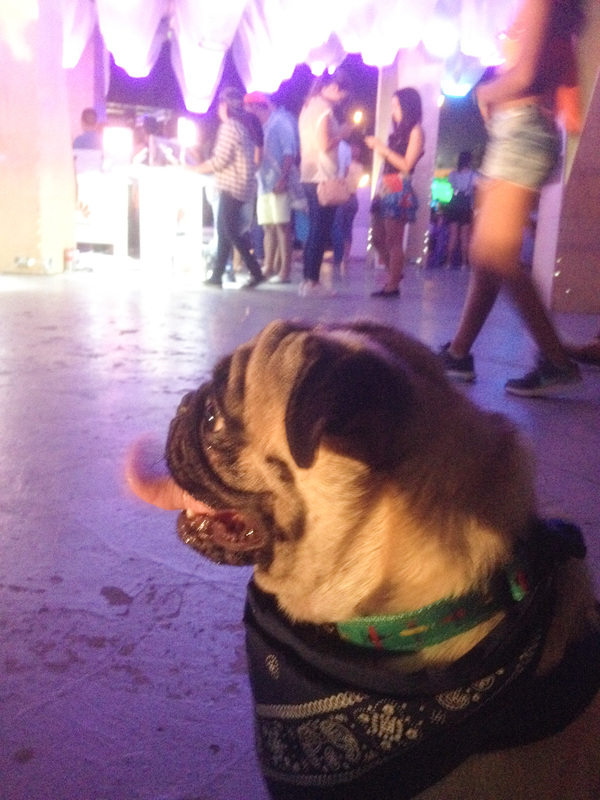 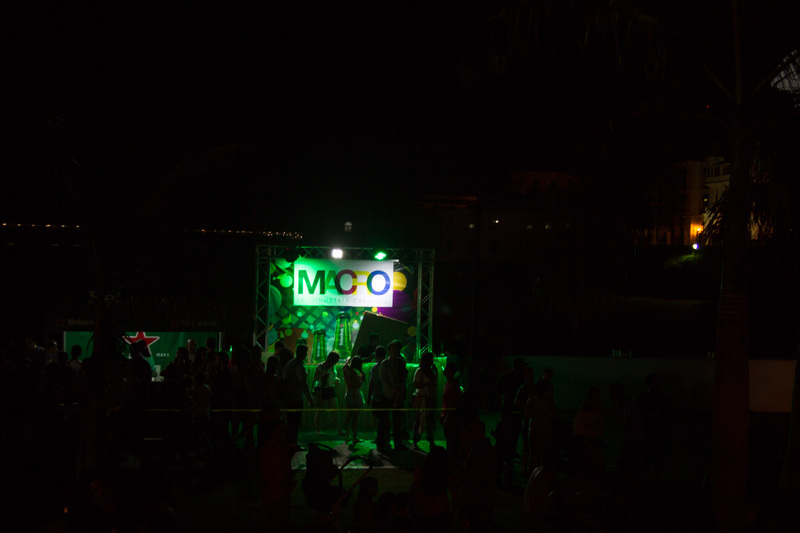 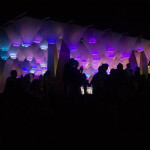 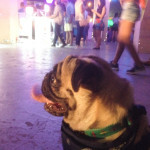 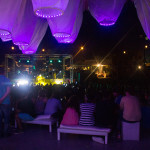 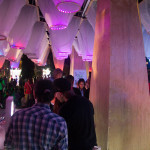 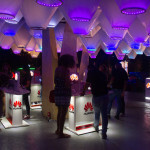 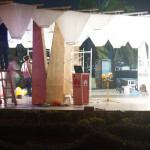 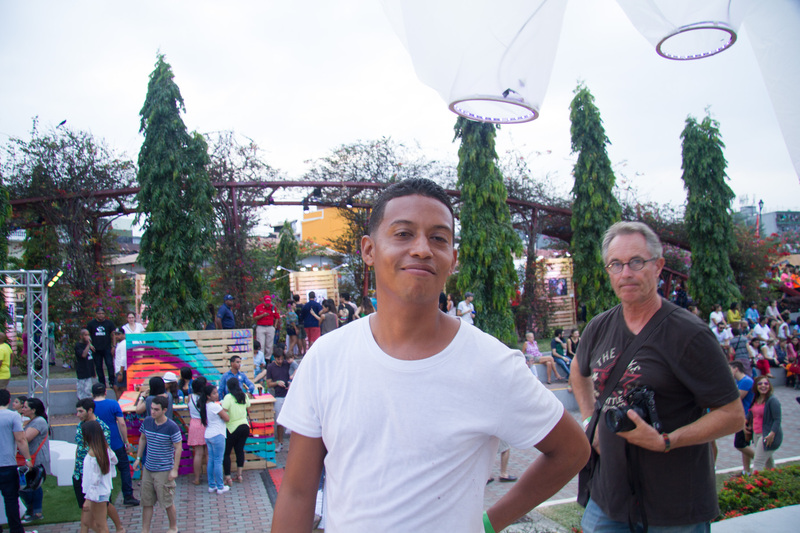 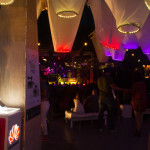 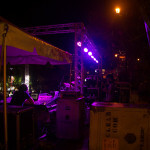 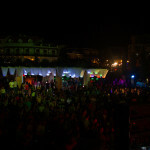 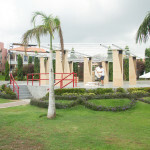 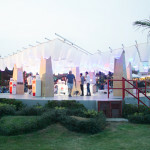 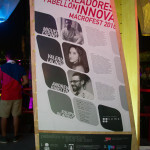 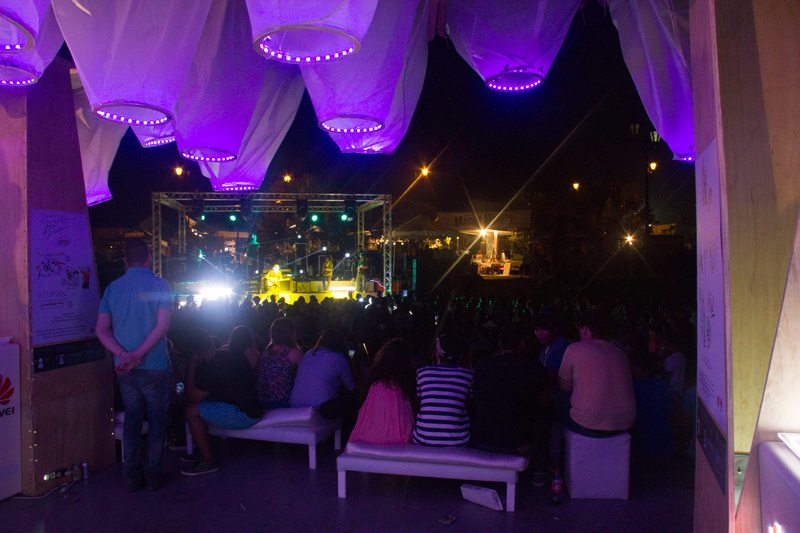 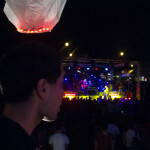 Macropavilion was installed for a week long art, design, fashion, and music festival in Panama called Macrofest. 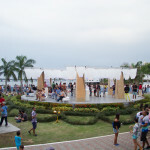 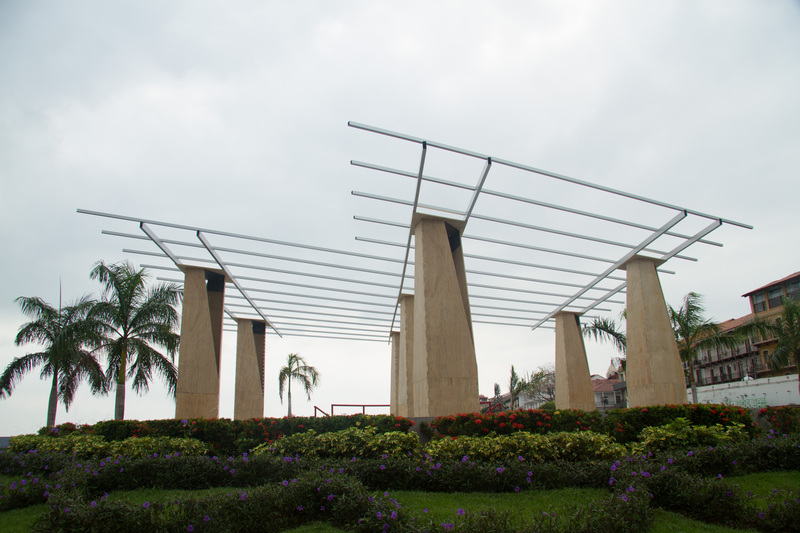 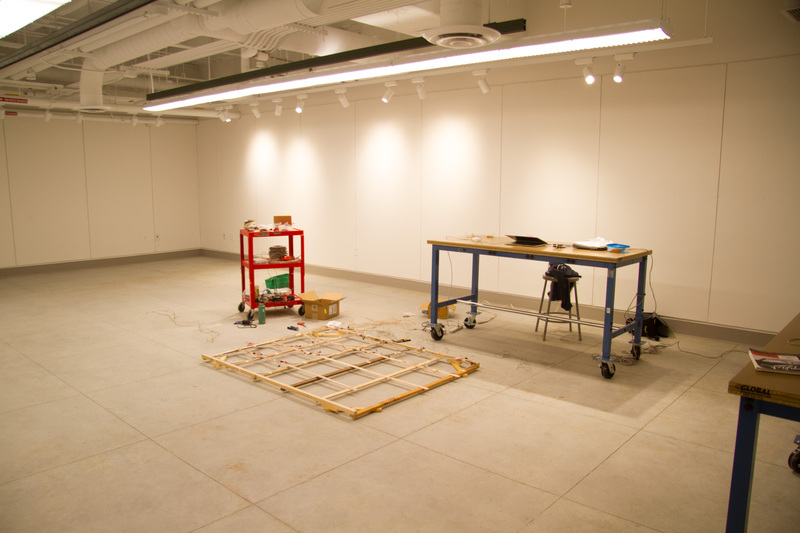 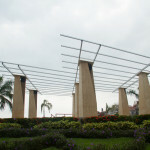 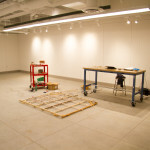 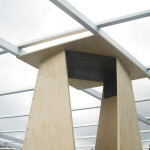 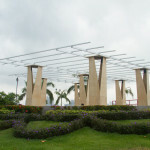 The structure consists of seven, three-meter tall columns of CNC cut plywood and welded steel that support a connected lat- ticework roof of aluminum beams.The beams crisscross, form- ing a grid pattern of 138 diamonds, each with sides measuring one-by-one meters. 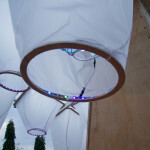 Each diamond holds an upside-down fabric “funnel” with the large end connected to the diamond and the small end hanging freely downward. 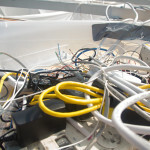 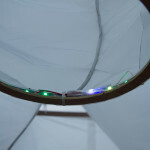 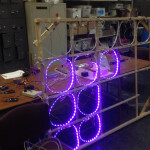 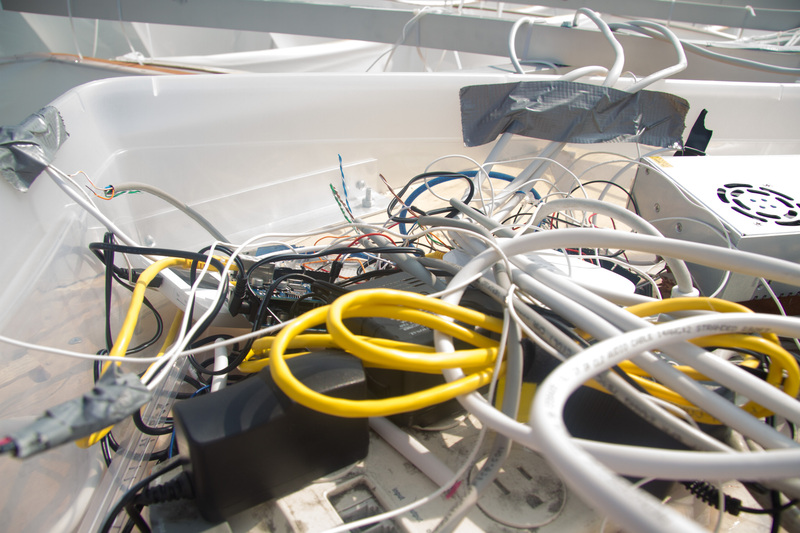 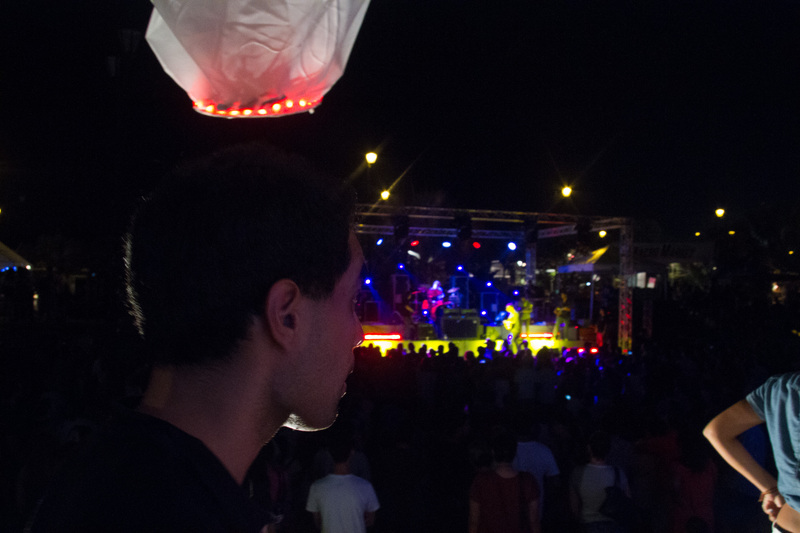 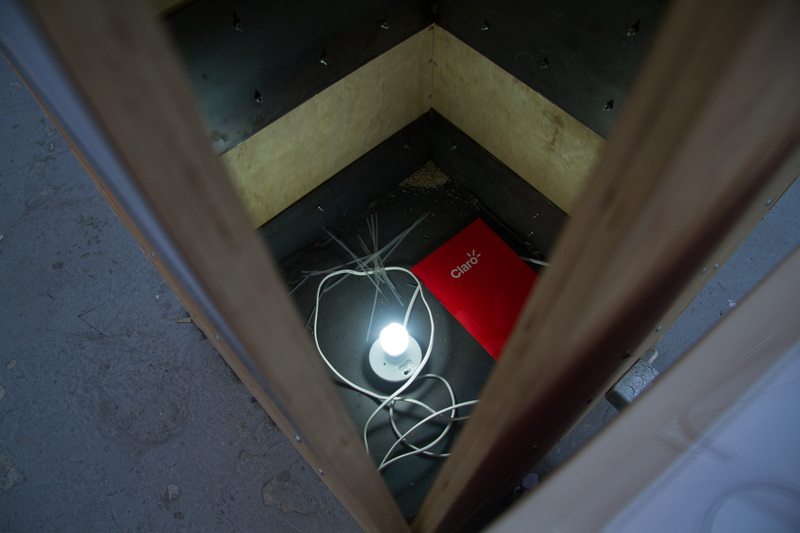 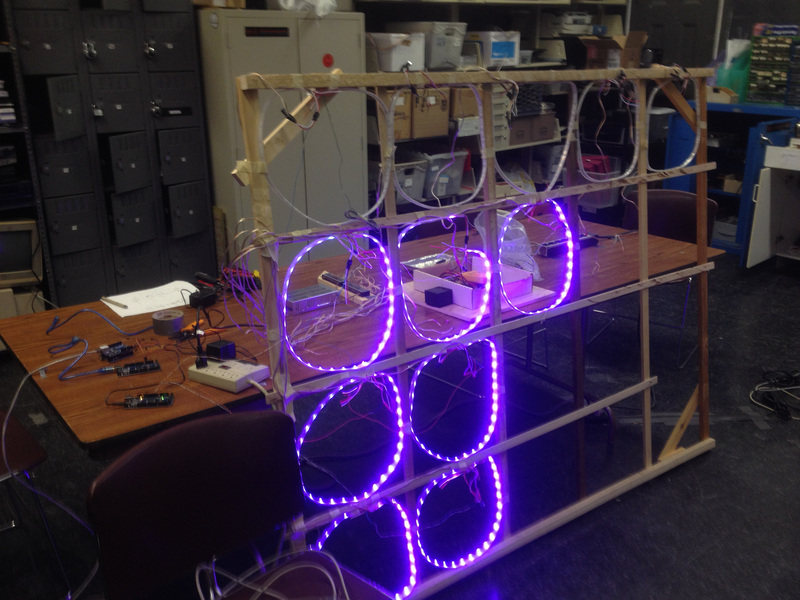 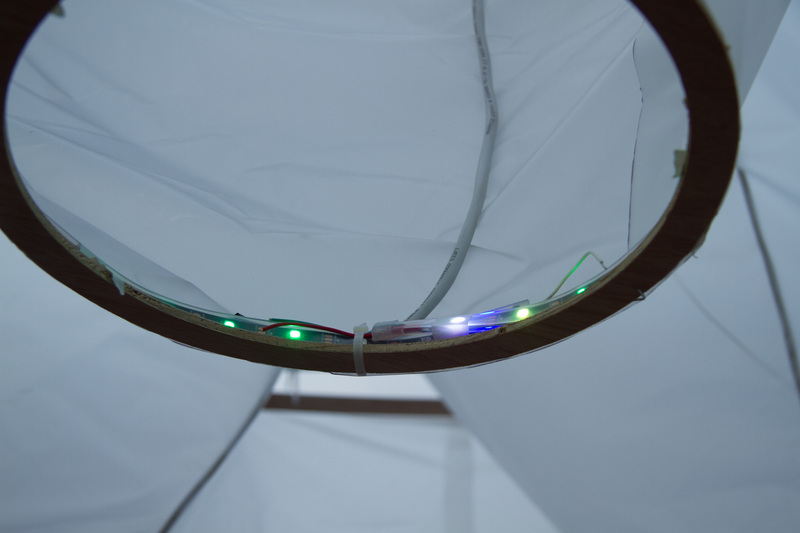 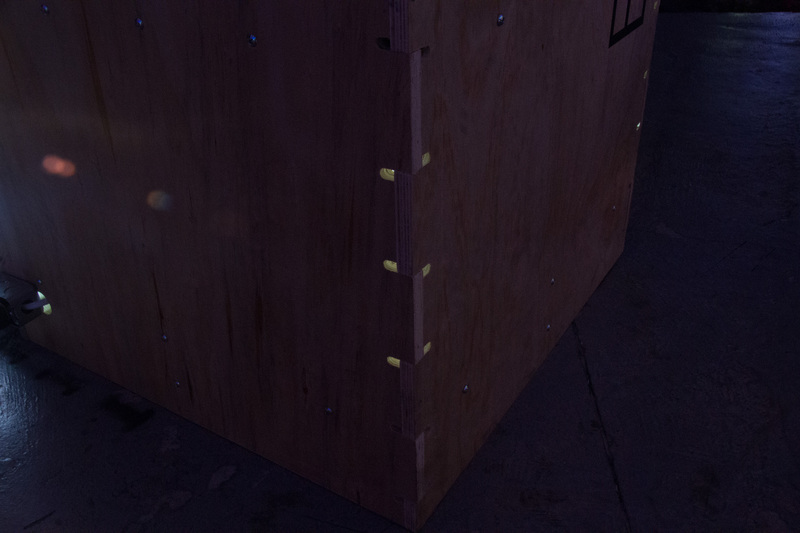 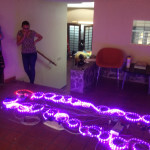 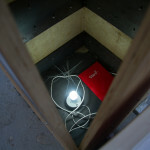 At the small end of each funnel is attached a circle of LEDs one meter in circumference. 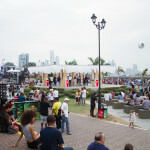 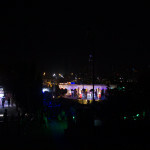 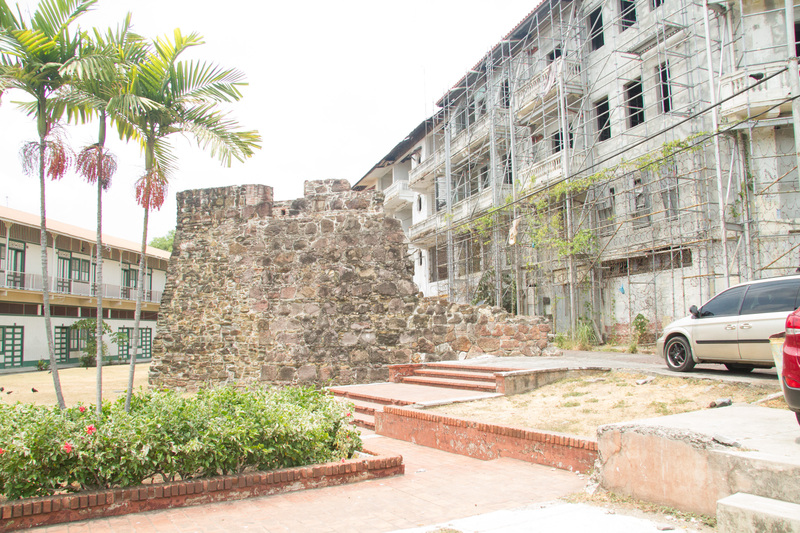 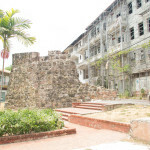 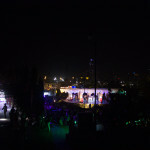 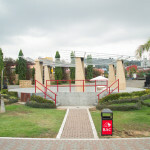 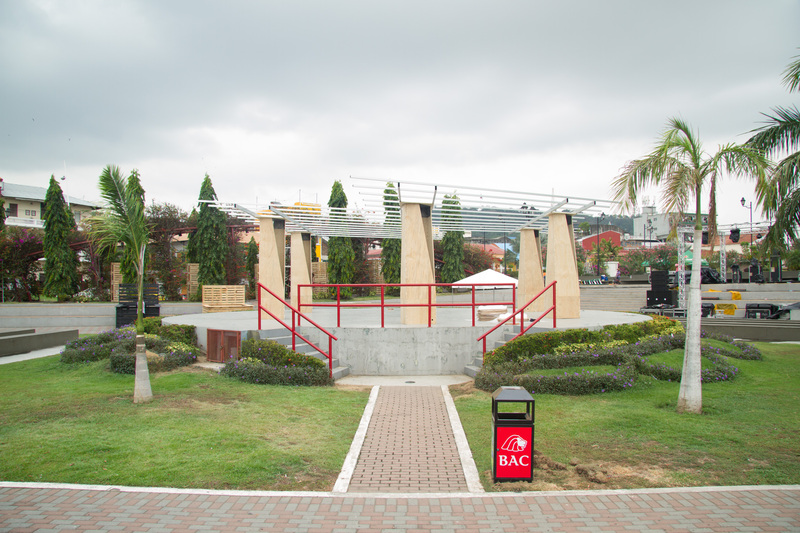 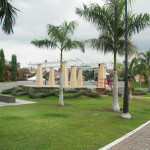 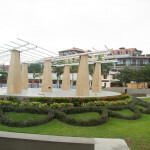 The entire structure sits on a circular concrete platform approximately twenty meters in diameter. 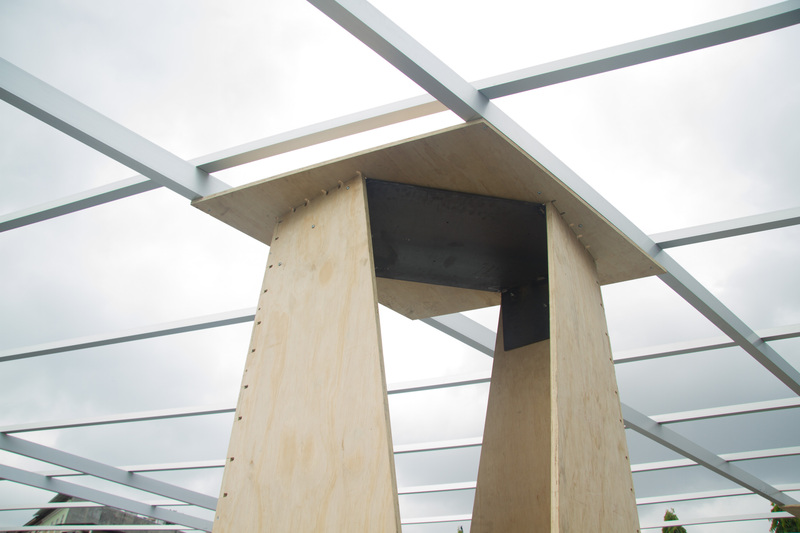 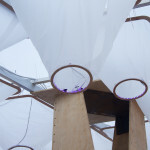 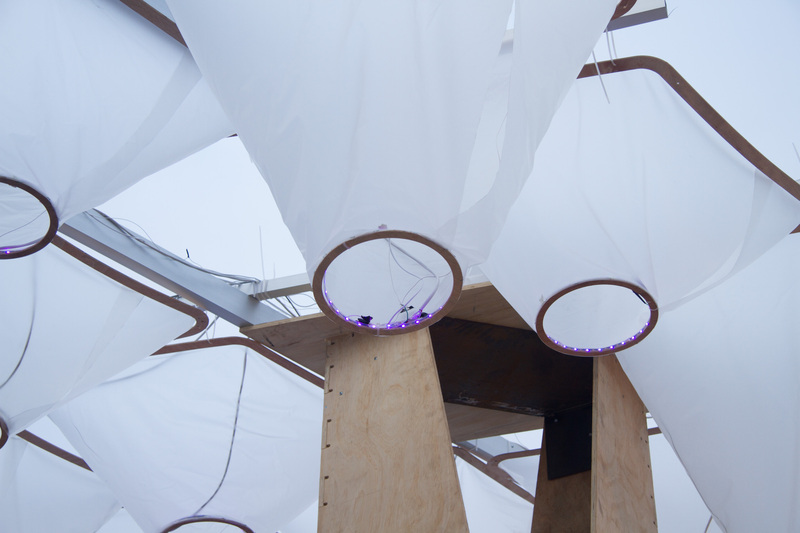 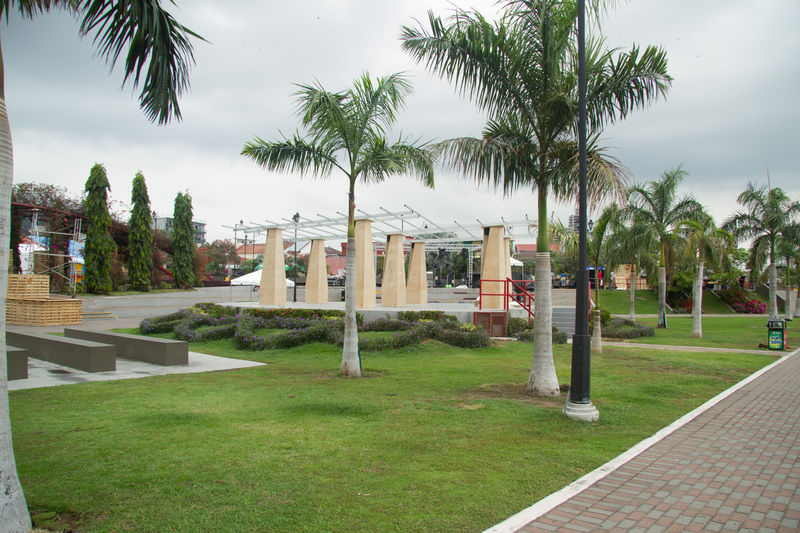 Visitors may walk under the structure freely, interacting with the funnels.